The role of chemistry is critical in determining the recovery and grade of concentrates in flotation. Optimal liberation and hydrodynamics, relative to particle size, may be completely negated given insufficient hydrophobicity of target mineral particles and limited differential hydrophobicity (selectivity) between value and gangue phases. At the core of the AMIRA P260 series of research projects has been the understanding and control of pulp chemistry and its influence on mineral particle surface properties in the flotation. This has included Eh/pH effects, oxidation and/or dissolution control, depression of gangue, dispersion, activation and deactivation, collector adsorption mechanisms, mitigation of salinity and process water effects, froth behaviour, etc. These processes have also been studied with respect to particle size and morphology, making the connection with hydrodynamics. 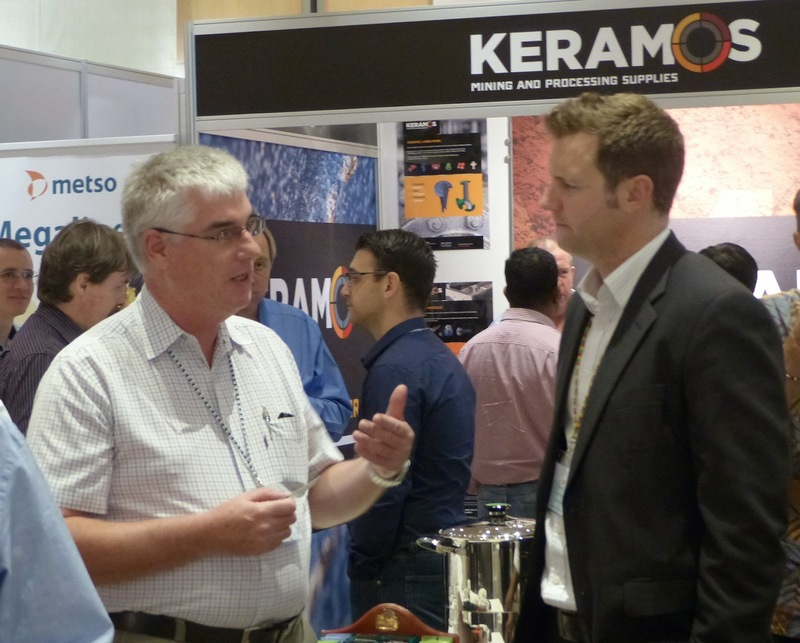 The combined use of bulk, solution and surface analytical methods have played a major role in the long term success of AMIRA P260 and its delivery of outcomes, including more than $1 billion return on investment, to the minerals processing sector. 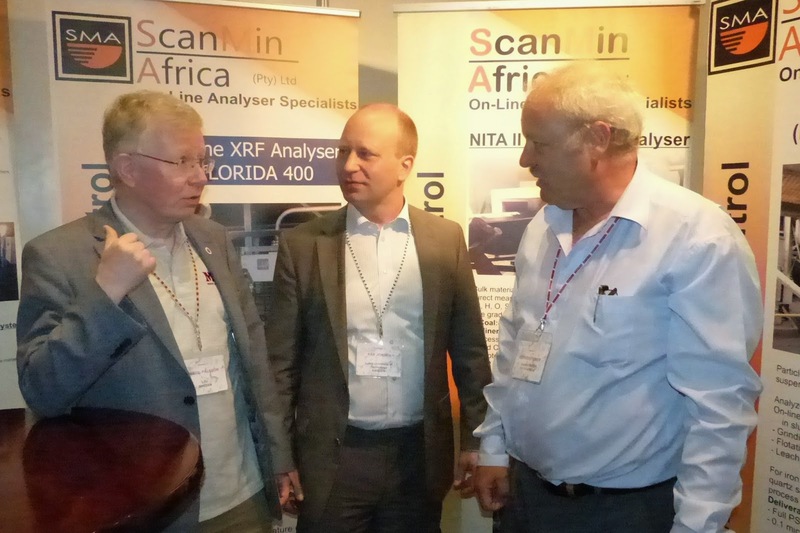 Prof. Bill Skinner of Australia's Ian Wark Research Institute, has been associated with the flagship AMIRA P260 flotation series of projects since 1993 and has led it since 2011. We are pleased that he has accepted an invitation to give a keynote lecture on typical and unusual pulp-surface chemistry mechanisms in flotation at Flotation '15, in the Fundamentals of Physics and Chemistry Symposium. This will supplement the keynote by Prof. Jan Cilliers, of Imperial College who will discuss modern methods of exploring the physics of flotation. 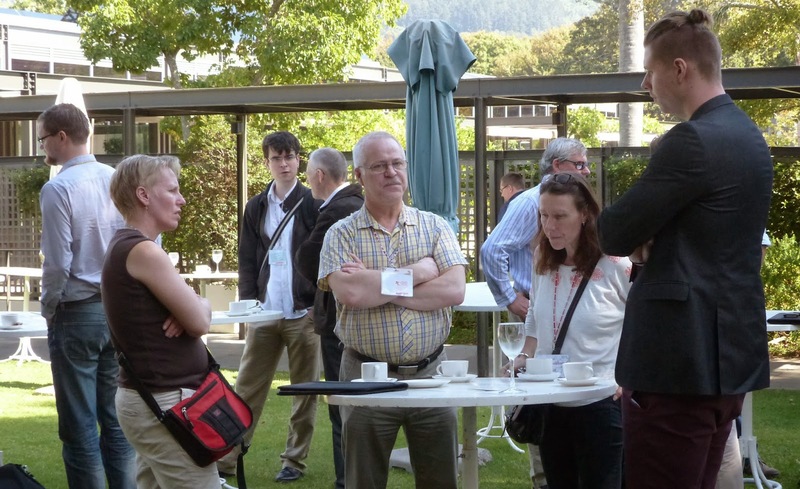 The 3rd keynote, in the Applications Symposium, will be given by Peter Amelunxen, of Aminpro, Chile, recipient of the 2011 MEI Young Person's Award. 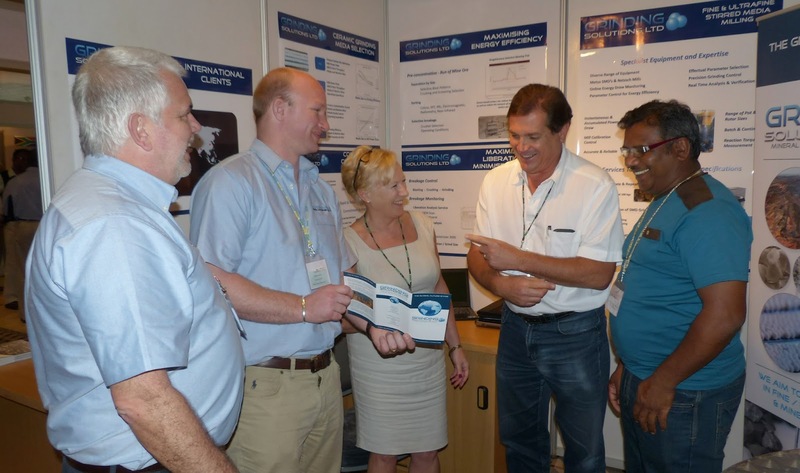 A number of delegates at Comminution '14 expressed an interest in our post-conference self-drive tour of Namibia. So for the benefit of future delegates, and anyone else who may wish to undertake this adventure, below is a blow by blow account of our 9 day, 2000 km tour, beginning and ending in Windhoek. 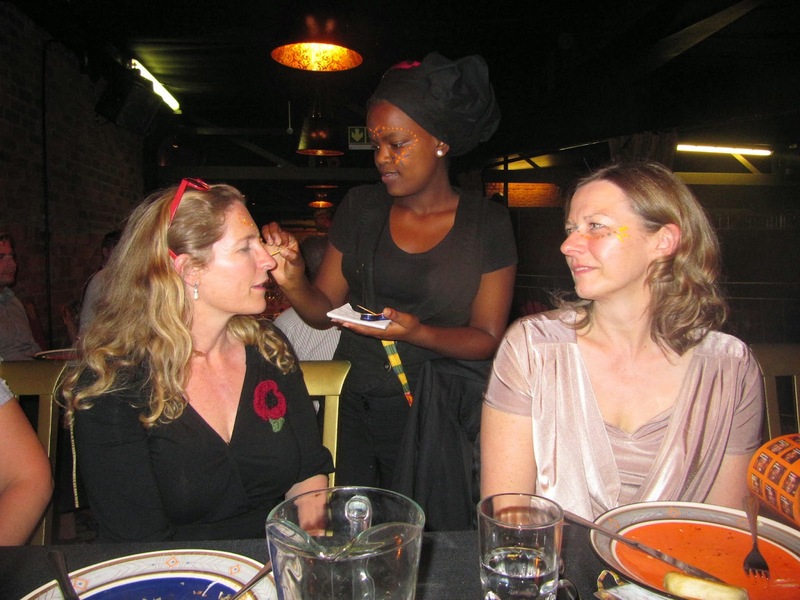 The itinerary was recommended by our excellent agent in South Africa, Rene Simpson, and I would suggest that if you are interested you contact her to customise your own tour. 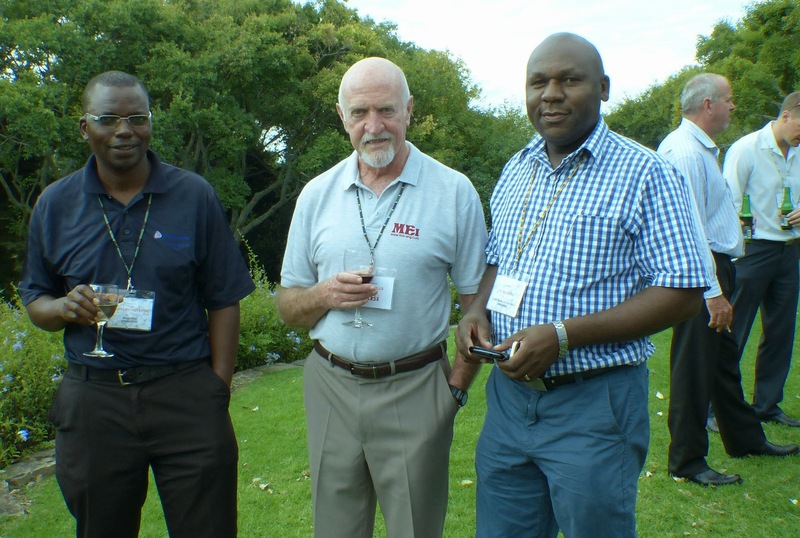 This was our second visit to Namibia, the first being to Fish River Canyon in the far south after Comminution '12 (posting of 28 April 2012). The early morning plane from Cape Town to Johannesburg, then on to Windhoek, where we picked up a rental car. Then a very hard 5 1/2 hour drive to Swakopmund almost all along the C28, a very rough dirt road, nearly two hours of which were in darkness. Compensation for the tough drive was slightly provided by the spectacular sunset just after driving through the Bosua Pass. 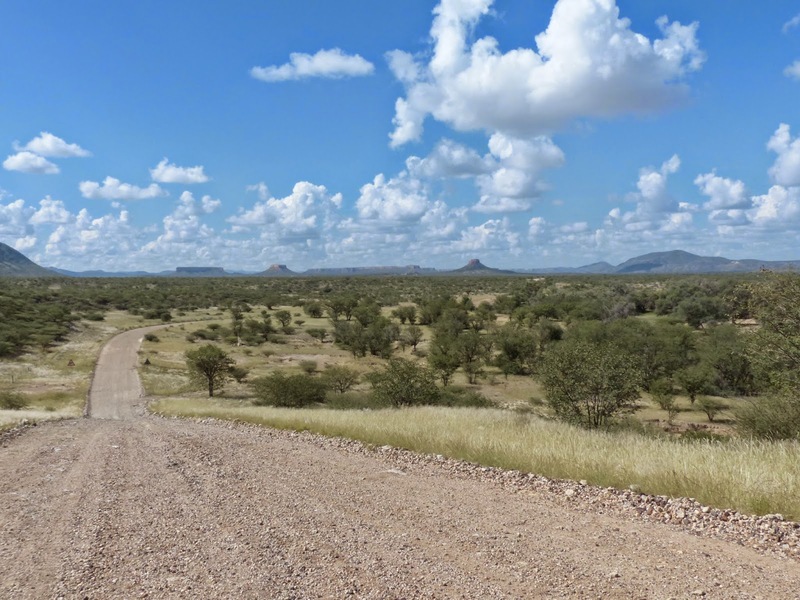 If you are not experienced on driving on African untarred roads, this might not be the route for you, as it can be a little scary mile after mile, and there is a great sense of isolation, we having seen only a handful of other vehicles in around 300 km. 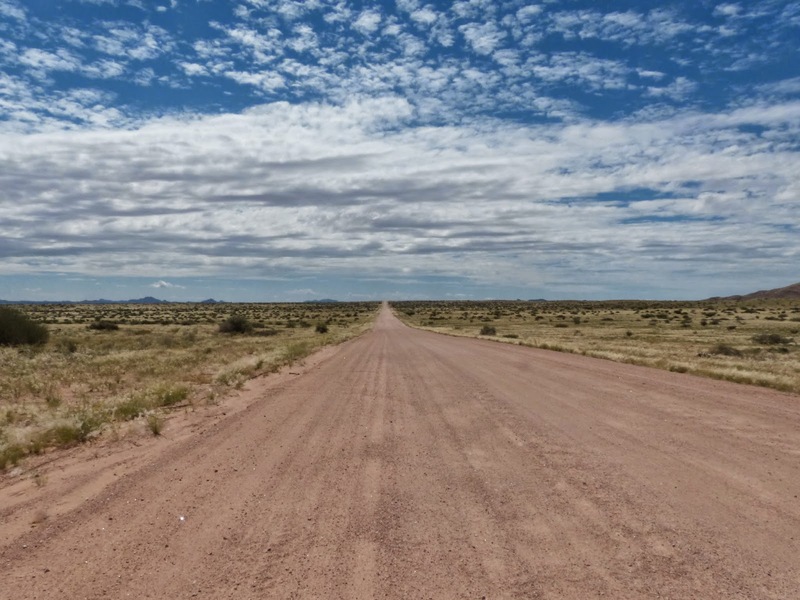 The uninitiated might like to take the less scenic tarred B2, which takes you to Swakopmund in around 4 hours, or fly direct to Walvis Bay rather than Windhoek. 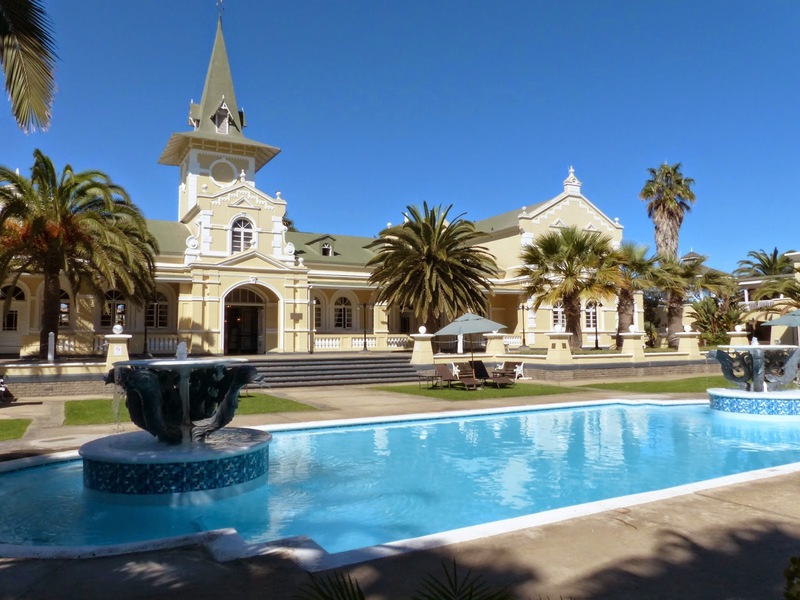 We spent an hour looking round the historic buildings of Swakopmund, a town with a very distinctive German atmosphere. The most impressive of these buildings is the old railway station, built in 1902, and converted into a hotel in 1994. This is where we based ourselves for two nights. 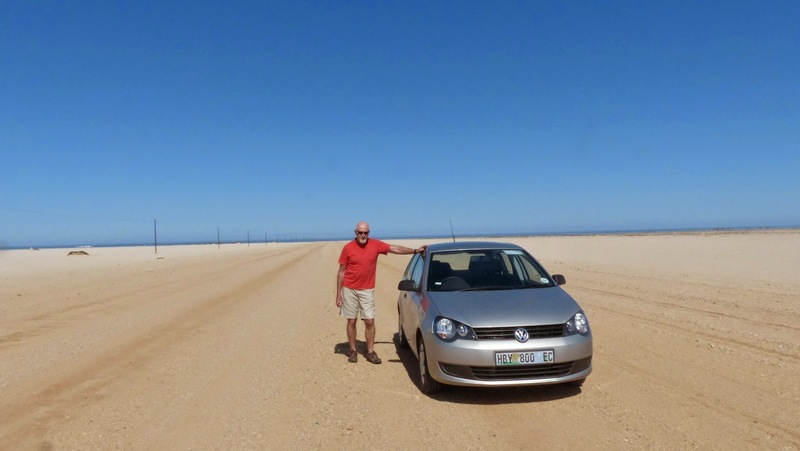 We then drove south down the Atlantic coast to the uninspiring harbour town of Walvis Bay. A nice drive between the sea and the dunes of the Namib desert, but marred by a very heavy on-the-spot fine at a police road block, a reminder to all visitors to carry your driving license with you at all times! It is a serious offence not to do so. 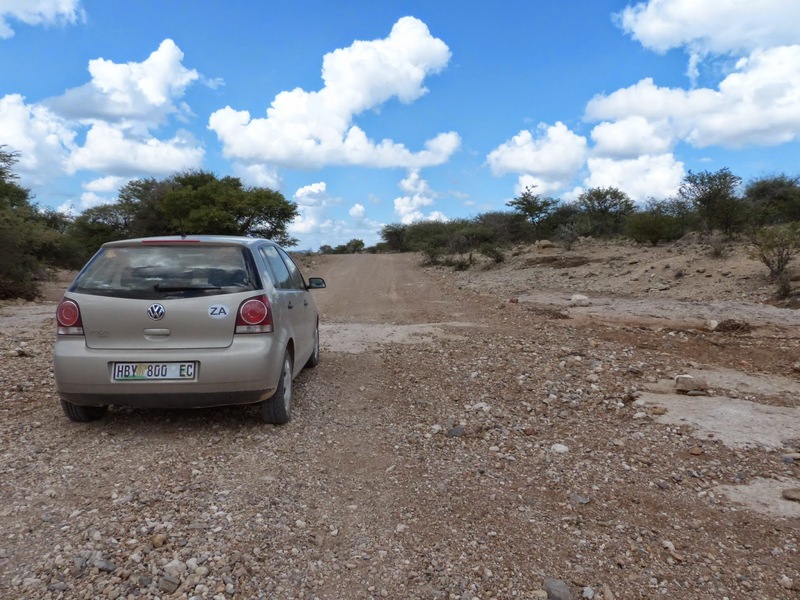 Another 5 and a half hour, 365 km drive today, mostly on dirt roads of varying quality to Vingerklip Lodge in the heart of the Damraland region. 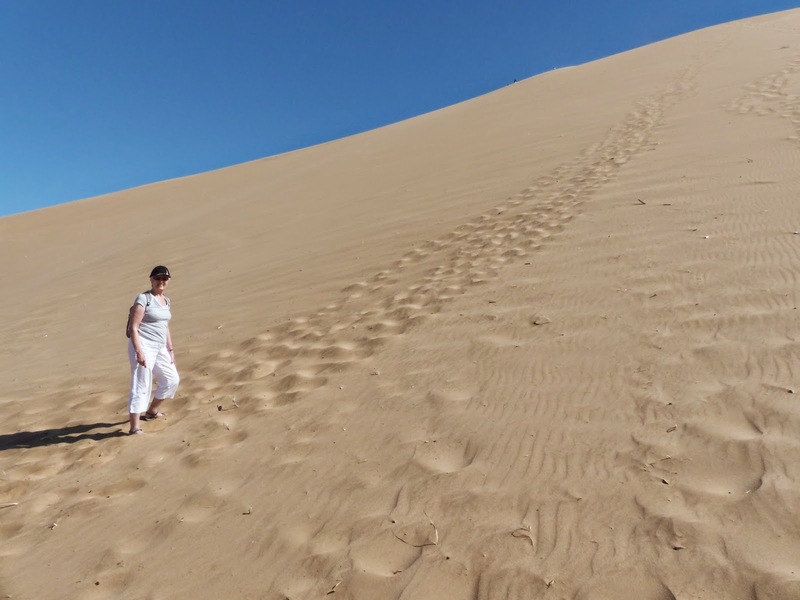 A day of dramatic changes in scenery from the bleakness of the Skeleton Coast from Swakopmund to Henties Bay, and the desolation of the Namid Desert, to the grandeur of the mountains between Khorixas and Outjo. 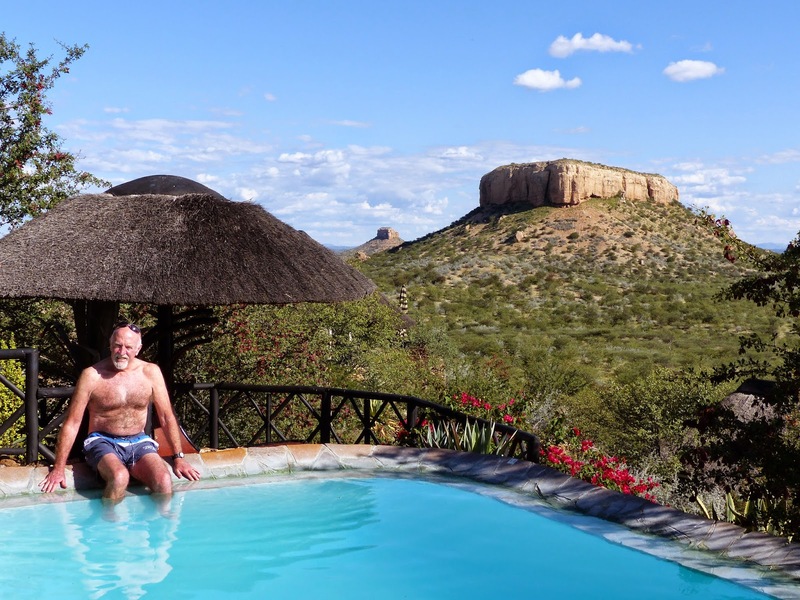 Rarely have we stayed at a more spectacular setting than Vingerklip Lodge, overlooking the flat-topped Fransfontein Mountains. We have a solitary suite, Heaven's Gate, perched at the top of a huge limestone monolith. Do not book in here unless you have a reasonable level of fitness, as it is a hard 15 minute climb from the main lodge, including a final ascent up 190 steps, but well worth the effort. 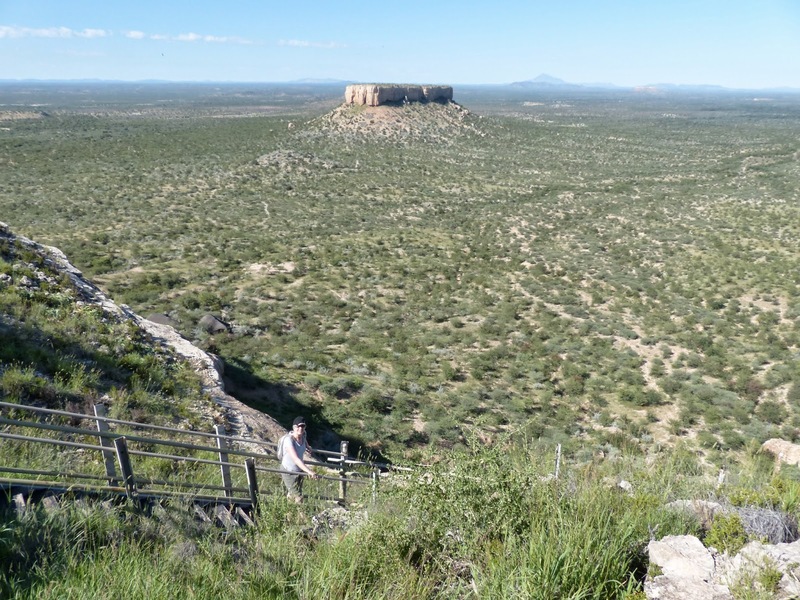 As the sole residents of the mountain top we were treated to personalised service for breakfast, after which we walked in 36 degree heat to nearby Vingerklip (Finger Rock), a 35m column of limestone conglomerate, this and the surrounding mountains being relics of an earlier plateau which was subsequently eroded by the Ugab River. And then a rare chance to relax by one of the lodge pools, and catch up with emails. 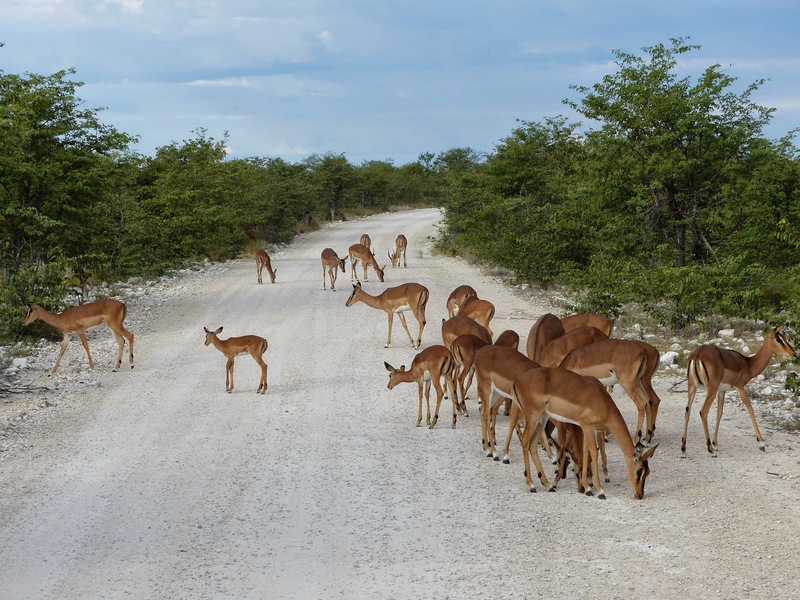 A relatively easy 4 and a half hour drive today, on dirt and tar roads, to Etosha National Park, one of the world's great game reserves, covering 8,598 sq. miles. Our destination was the Dolomite Camp in the west of the park, an area until very recently being inaccessible to tourists. 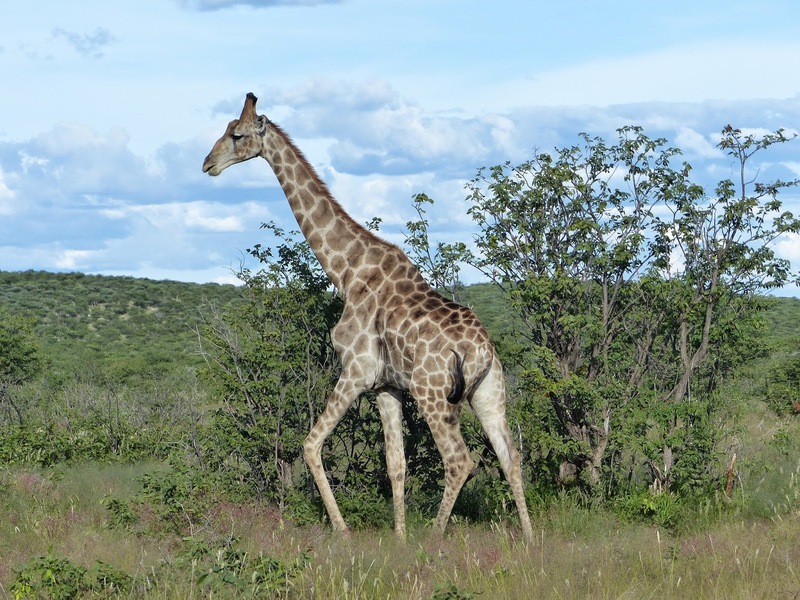 Dolomite, opened in 2011, is the newest of the Etosha camps, nestling in a dolomitic outcrop. 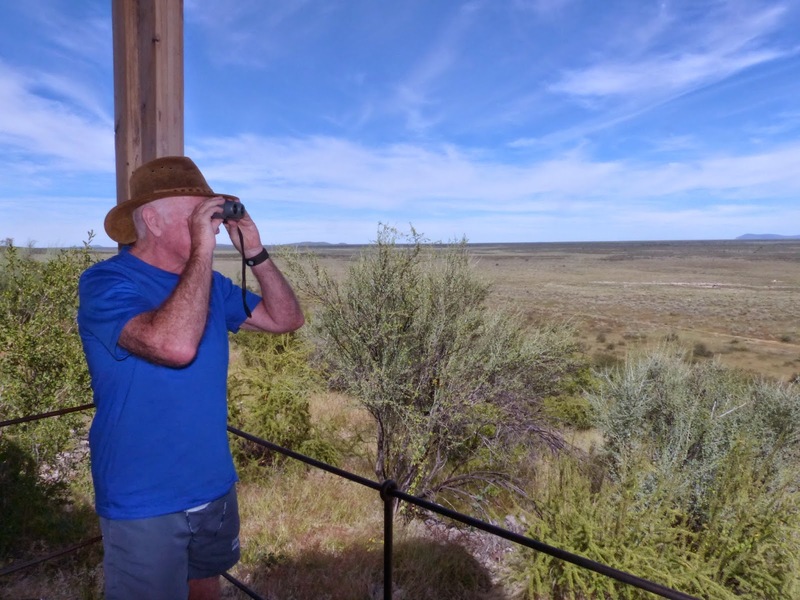 A morning relaxing on our cottage veranda watching zebra, oryx, ostrich and springbok on the vast plains below us. 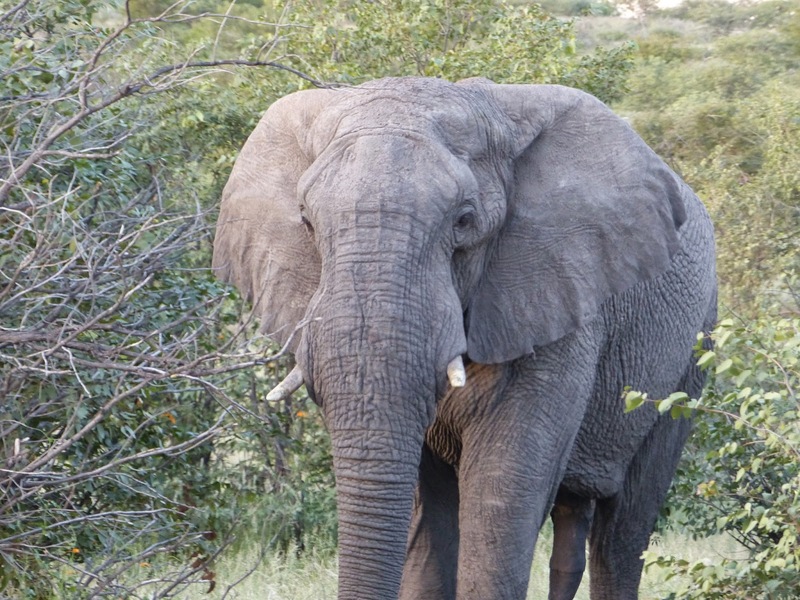 Then an afternoon game drive, where we saw only one of the 'big five', a lone bull elephant. 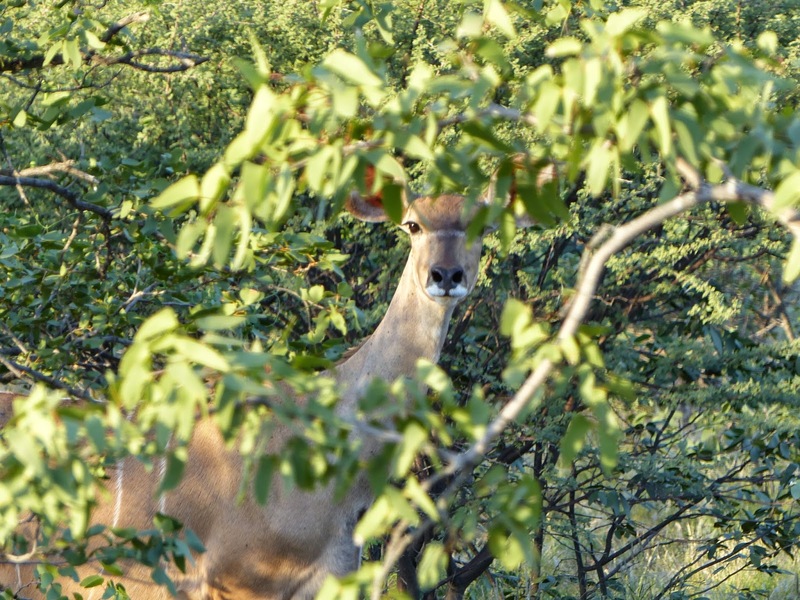 April is not a great time for game viewing, being the end of the rainy season, so the animals are widely dispersed around the park. 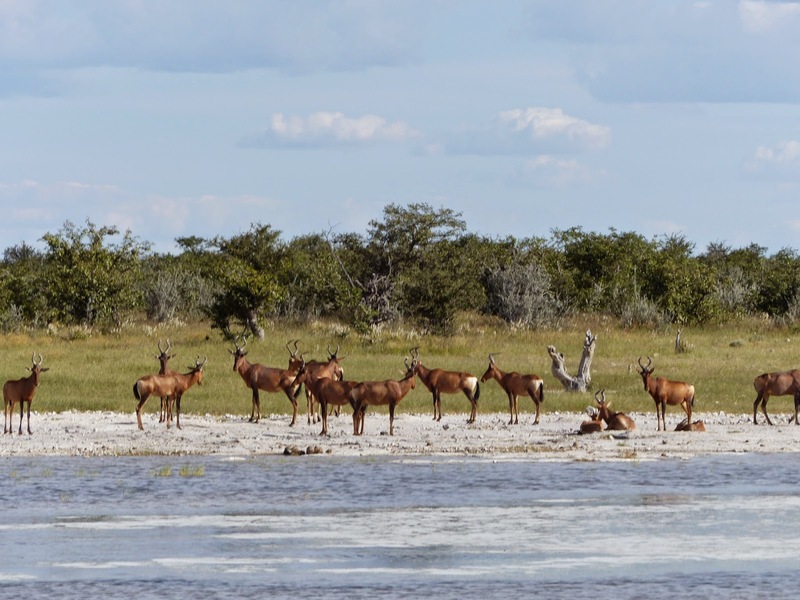 The best time for a visit to Etosha would be the end of October, the end of the dry season, when water supplies dwindle and animals congregate in large numbers at the remaining water holes. A relatively easy 180km drive this morning across the Park, the first two thirds across a desolate wilderness, with very few animals to be seen. However as we approached Okaukuejo camp in the east, our destination for the night, we encountered huge herds of zebra and springbok. 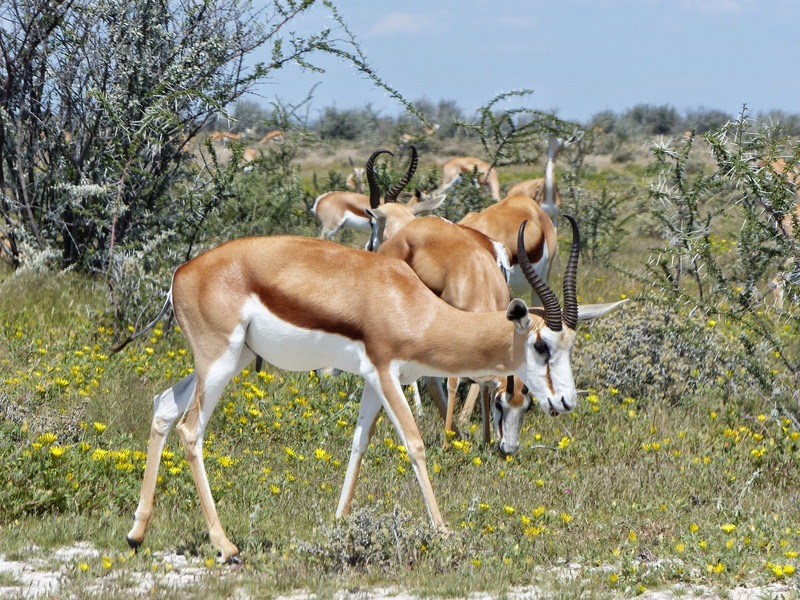 Okaukuejo is Etosha's oldest camp and sits on the perimeter of the massive mineral pan, which covers about 25% of the surface of the park, and gives the park its name, meaning 'Great White Place'. 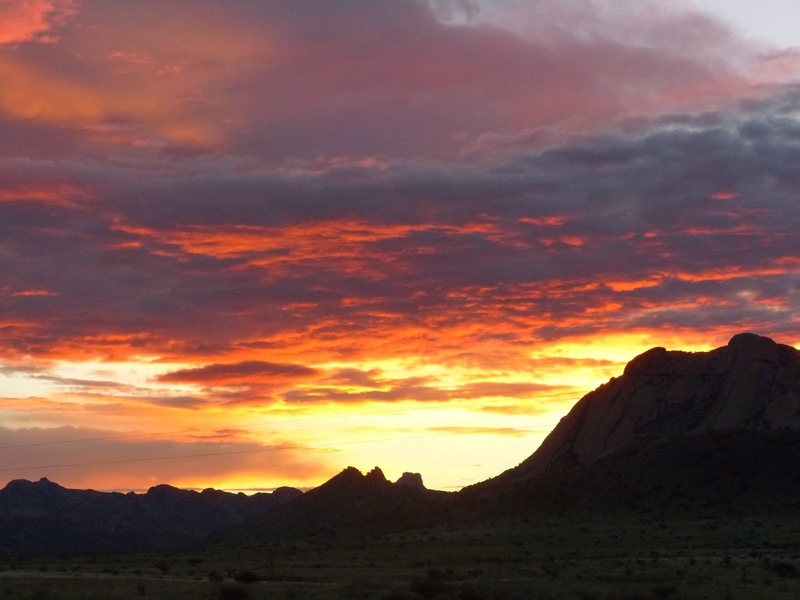 The pan was originally a lake fed by the Kunene River, but with the change in course of the river, over thousands of years, the lake dried up, and is now a large dusty depression that only temporarily fills, or partially fills, with water during the rainy season. 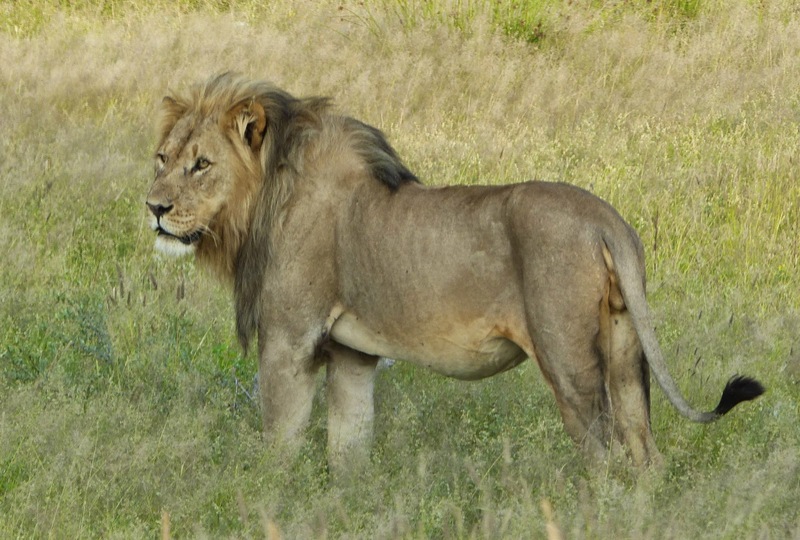 We took an evening game drive and saw virtually nothing for the first two hours, then just before sunset a fine male lion emerged from the bush, and strolled along the road to an evening sundowner by his local watering hole. 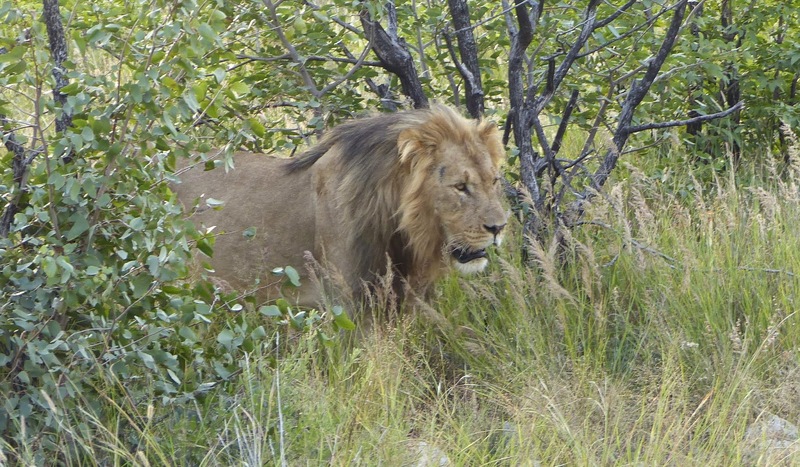 Number 2 of the big five ticked off the list. Made our way south today towards Windhoek on a good tarred road. 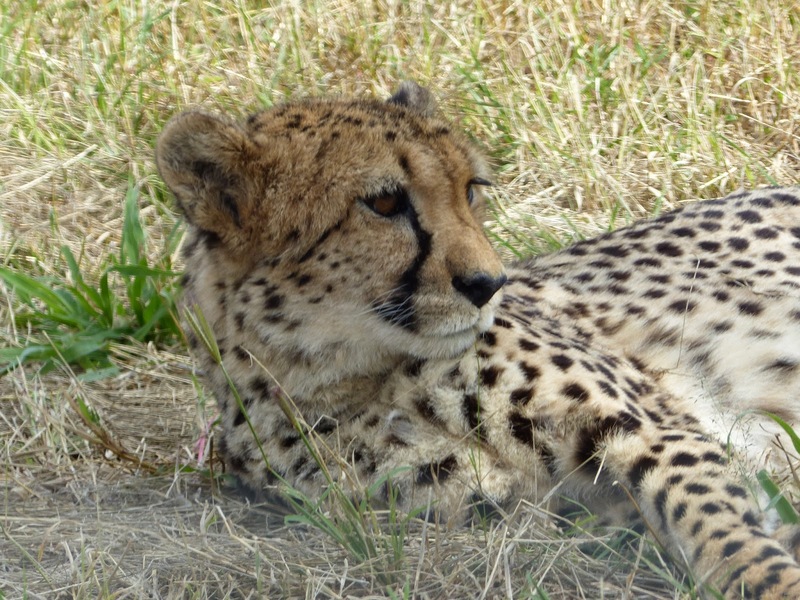 We made a very worthwhile detour at Otjiwarongo to the Cheetah Conservation Fund Centre, whose aim is to ensure the long term survival of the cheetah through research, education and conservation programmes. 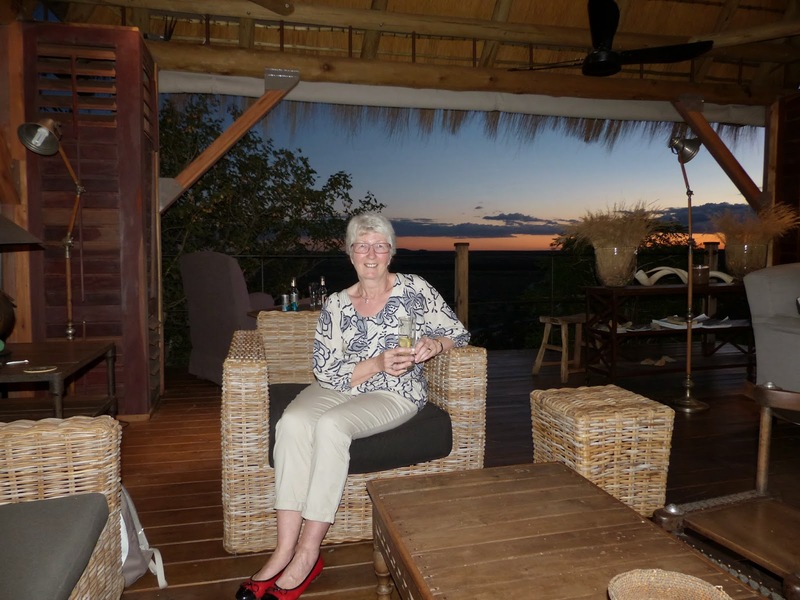 We stayed overnight at the Otjibamba Lodge just south of Otjiwarongo. We made a short visit to the crocodile ranch in the centre of Otjiwarongo this morning. 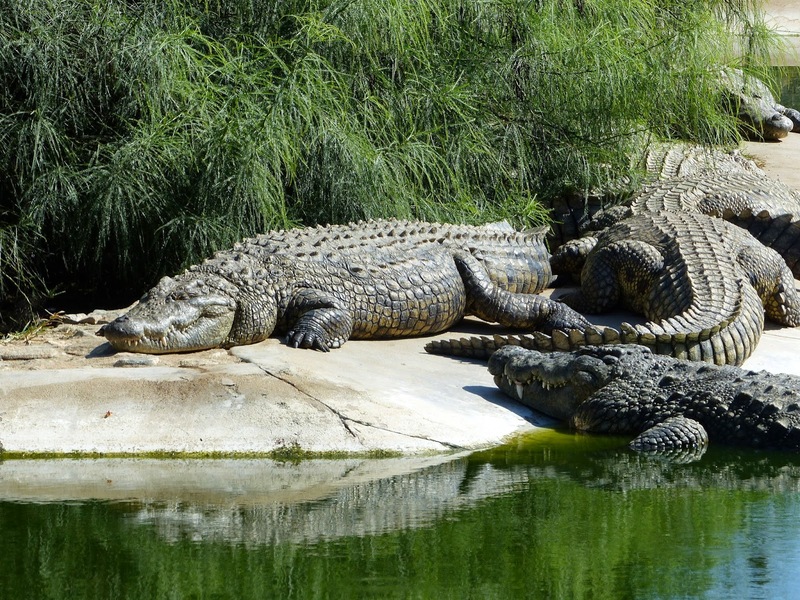 Here crocodiles are bred for their skins to satisfy the market for crocodile skin shoes, handbags, belts etc. Then an easy drive to Windhoek, and the Windhoek Country Club, our overnight stop before tomorrow's short drive to the airport. 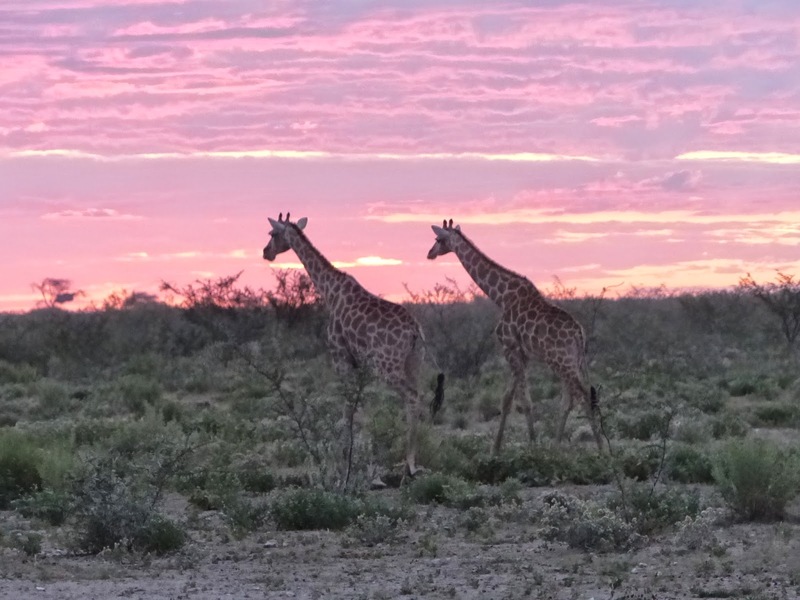 This has been an interesting nine days, giving a true flavour of Namibia - the sea, the desert, the mountains, and of course the famous Etosha. 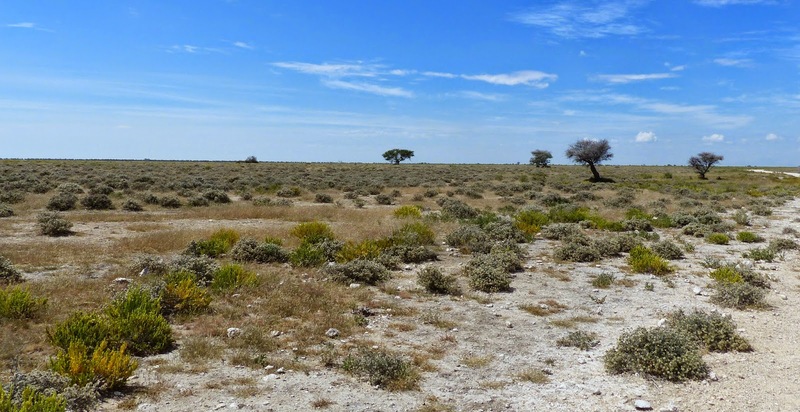 In retrospect, however, Etosha was the most disappointing part of our itinerary, due to what I feel was time wasted in travelling to Dolomite camp in the desolate west and then across the bleak wilderness to Okaukuejo in the east. 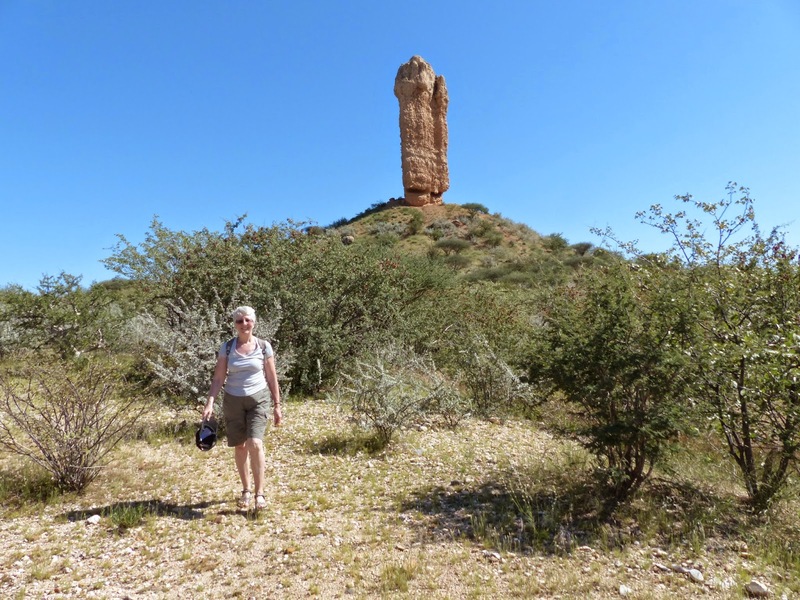 A much better route might have been direct to Okaukuejo from Vingerklip, then east along the pan to Nanutoni Camp, leaving via the Von Lindquist gate, and calling in at the old mining town of Tsumeb en route to Windhoek. 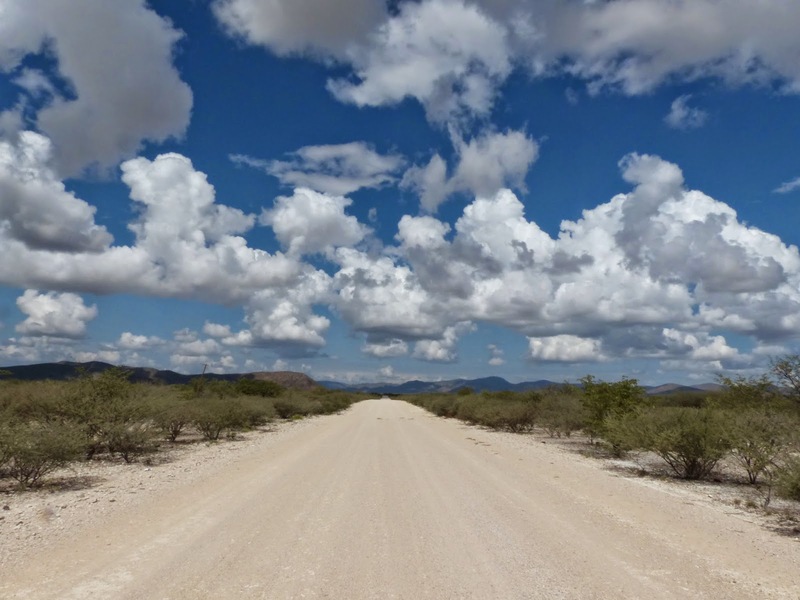 It would be interesting to hear from anyone who has done this and any other route in northern Namibia. 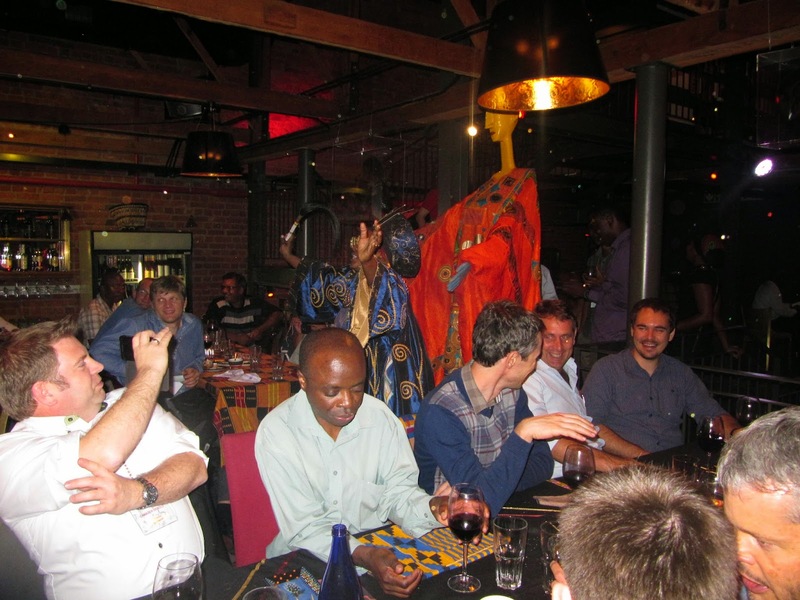 Although memorable, we have had journeys in Africa which have been more exciting, and to MEI Conference delegates who would like to experience 'real Africa' and its wildlife I would recommend the far north of South Africa (see Travels in Limpopo), which involves only a short flight to Johannesburg to pick up a rental car. 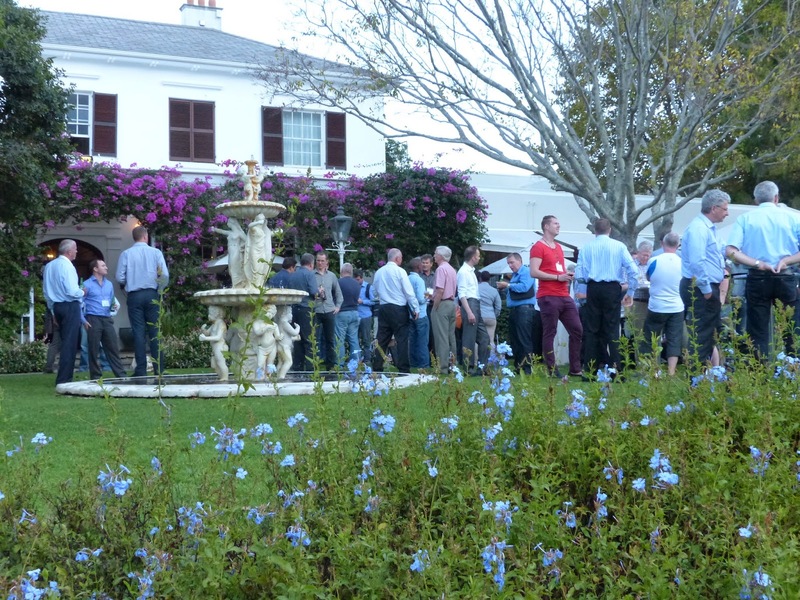 Comminution '14 was held at the Vineyard Hotel, Cape Town, South Africa. 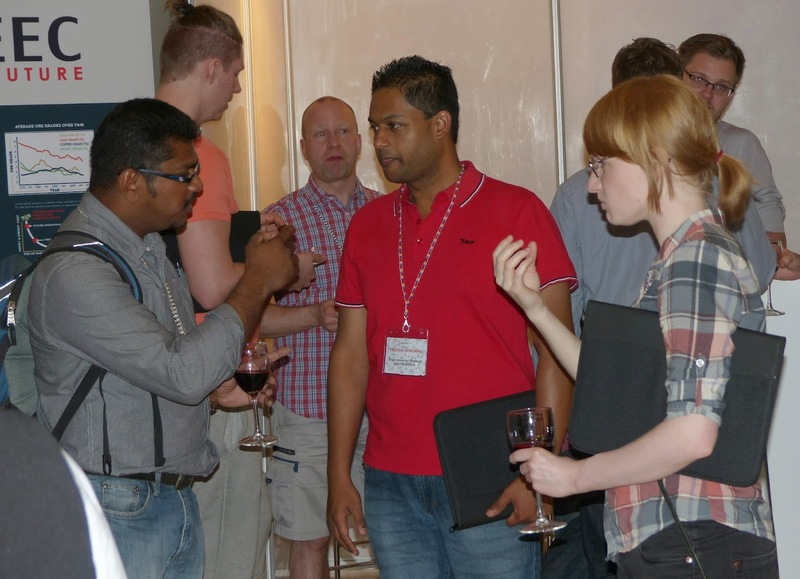 71 papers were presented in oral and poster sessions, and there was ample opportunity for networking around the 20 exhibition booths, and the evening social events. Below is my personal diary of events, to which I invite the views and comments of all those who attended. I opened Comminution '14, this morning, the 9th conference in MEI's comminution series, and the 2nd largest, with 226 delegates representing 27 countries, and 23 sponsors, reflecting the high degree of interest in this field, of which comminution legend Prof. Alban Lynch, the first Director of the JKMRC recently said will be the key mineral processing technology over the next 50 years. The first conference in the series was held in Camborne, Cornwall nearly 25 years ago, and the keynote speaker at that event was Tim Napier-Munn, one of our keynote speakers this week! Things have moved on a little since September 1989. There were around 70 delegates for that event and looking through the list of papers, there was no mention of stirred mills, which would have meant very little to the minerals engineers in the audience, but it was felt that grinding in high pressure rolls might have a future! I noted in my opening address at Comminution '89 that grinding had changed very little over the past 50 years, being mainly performed in rod and ball mills. 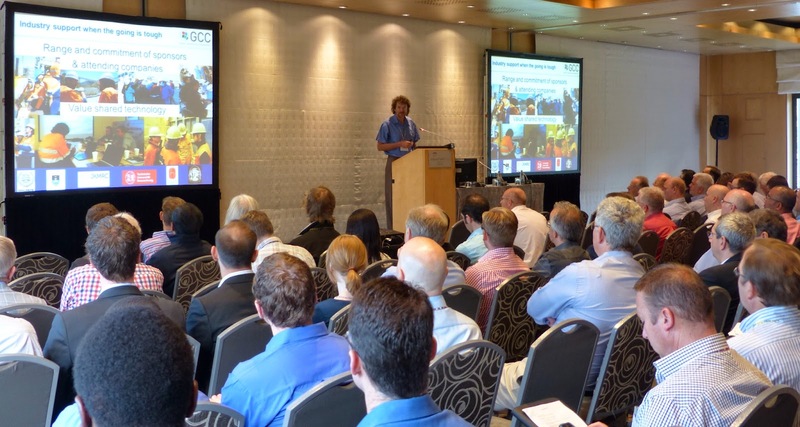 Tim's keynote addressed the status of comminution simulation in Australia, and there was a number of papers dealing with the blossoming field of computer simulation for various aspects of comminution. 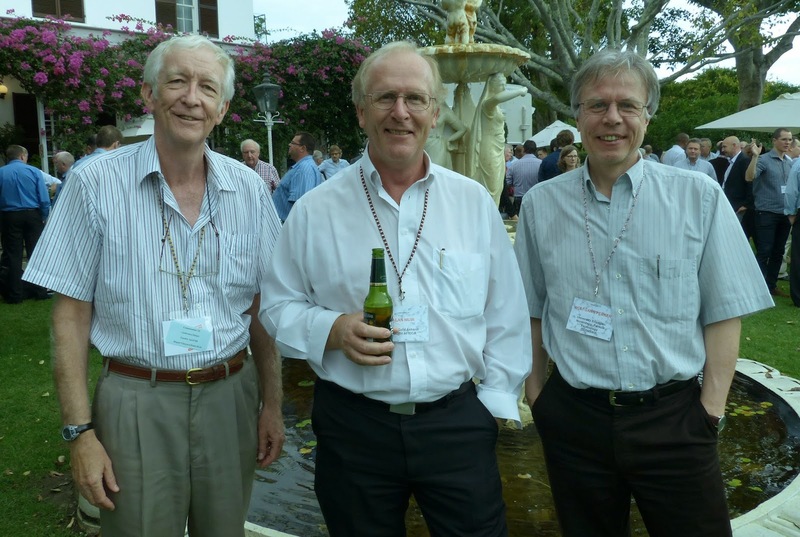 How things have changed rapidly over the past 25 years, and we have a lot to look forward to in this week's programme, as highlighted by MEI comminution consultant Prof. Malcolm Powell, of the JKMRC, who introduced the Global Comminution Collaborative and the need to pool our skills. 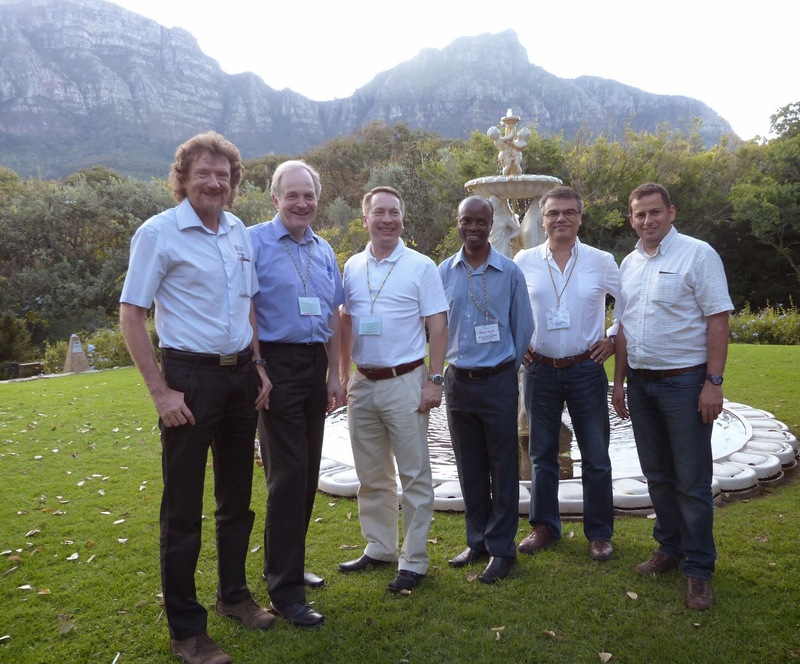 The recently formed GCC is a collaboration between the JKMRC in Australia, Sweden's Chalmers University, the University of Cape Town, Germany's Technische Universitat Braunschweig, the University of Rio de Janeiro, and Turkey's Haceteppe University, all of whom are represented at the conference. Before handing over to the chairmen of the first technical session, I had the pleasure of presenting the 2013 MEI Young Person's Award to Dr. Rodrigo Carvalho (see posting of 7th April). 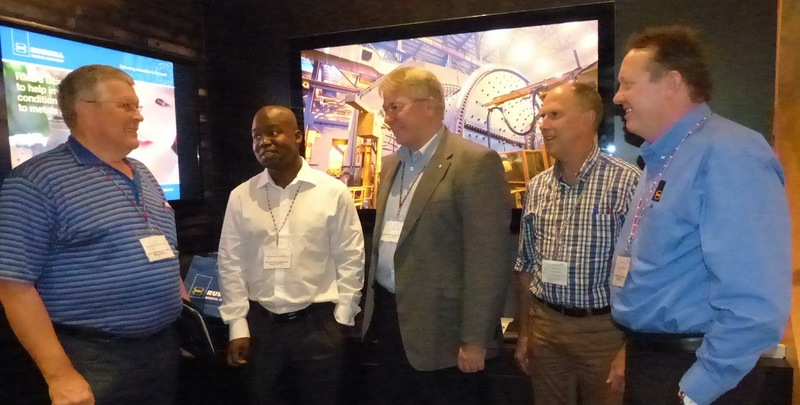 It is a commonly accepted fact that the hard rock mining industry needs more efficient comminution to counter some of the key challenges it is facing. 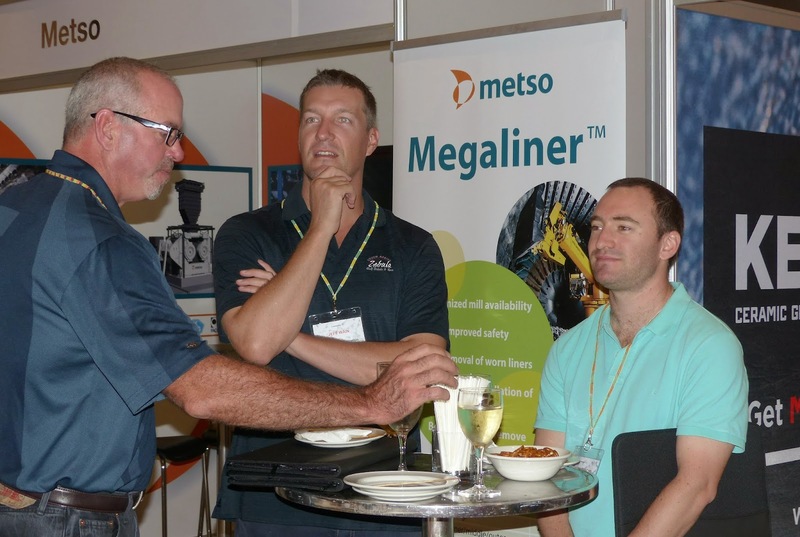 The response of the mining industry over recent years has largely focussed on increasing the size of equipment as demonstrated by the increasing dimensions, and motor sizes of SAG and ball mills. Today’s comminution circuits remain based on the application of impact, abrasion and compression to break the particles down to the size required for further processing and much of the work we will hear about this week will focus on improving the efficiency of these basic processes. It is however, an increasingly difficult game to play with the return on developmental work becoming incrementally smaller as efficiency improves.The first keynote lecture, delivered by Alan Muir of AngloGold Ashanti, South Africa, set the scene perfectly for the next few days by provoking discussion amongst the assembled experts on “what next” for comminution. He stimulated the debate by offering two topics for consideration, namely tension breakage and the removal of comminution (and ore removal) from the gold mining process completely and moving directly to in-situ liberation and leaching. This was an excellent start to the conference, and following Alan's keynote, the morning session was devoted to papers on crushing simulation, modelling and control, with contributions from Australia, Brazil, Finland and Sweden. 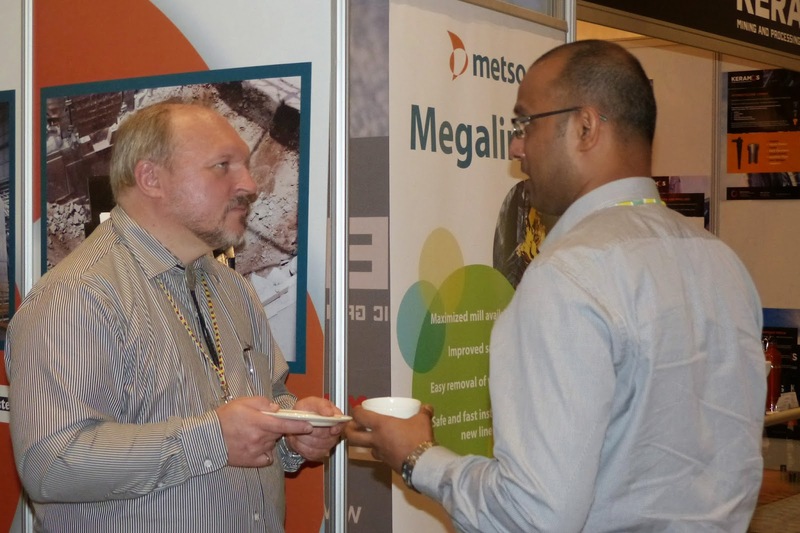 The long coffee break gave delegates their first chance to view the 14 poster presentations, and talk to the 20 exhibitors in the break-out area. Following the usual excellent Vineyard lunch, Dr. Steve Morrell was the first speaker in the afternoon session containing papers from Australia and Brazil on the modelling of ball, AG and SAG mills. 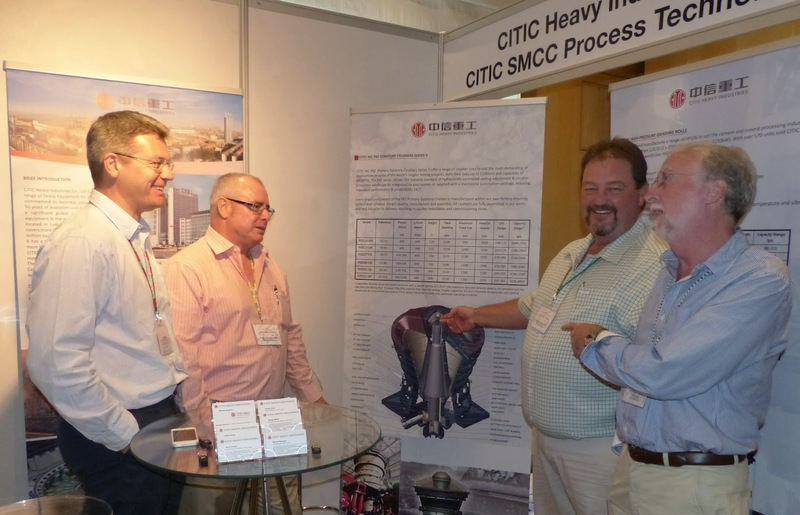 Steve is founder of CITIC SMCC Process Technology Pty Ltd which provides independent technical services to various mining projects, mainly in the area of comminution circuit design, technology and equipment selection, and optimization of mineral processing plants. 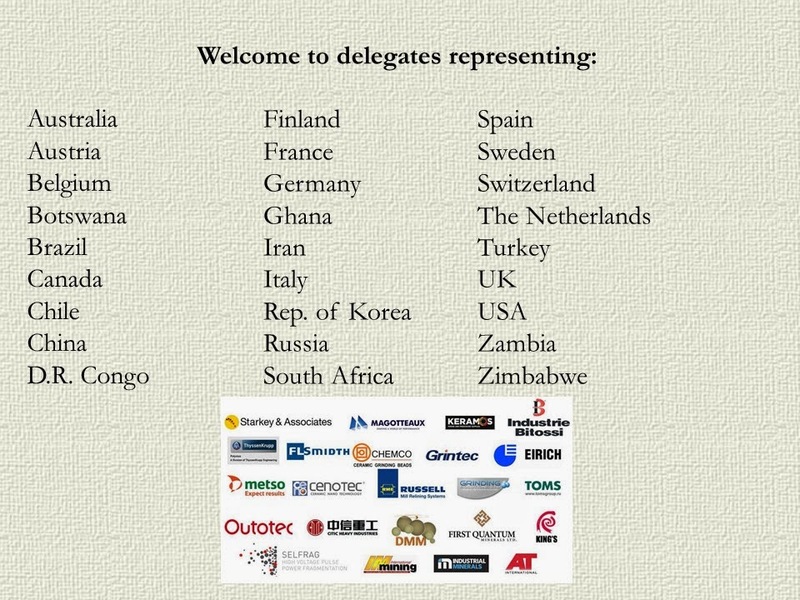 It operates as an independent consulting company, and is ultimately owned by CITIC Heavy Industries, a market leader in China with equipment operating successfully in China and around the world including Asia, Europe, America, Africa and Australia, and it is good to have them involved in the conference as both a sponsor and exhibitor. 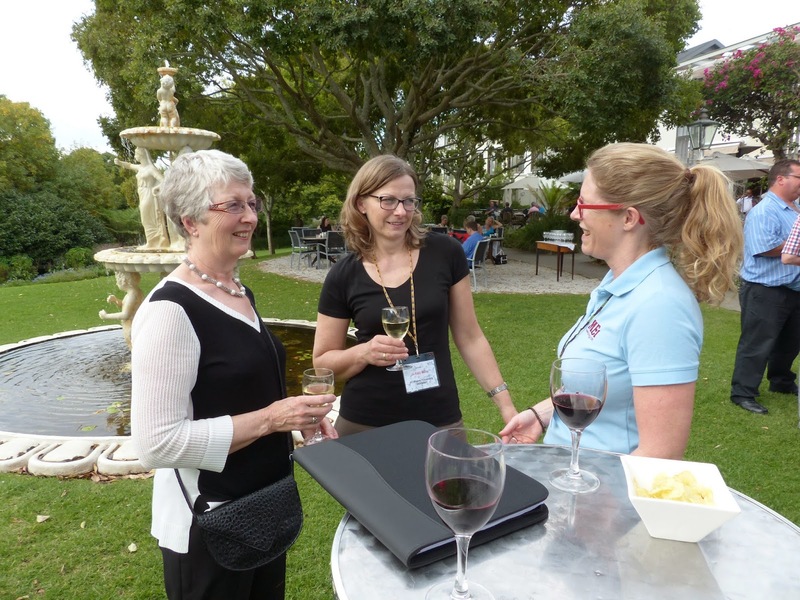 After a long day it was good to relax and talk to delegates during the first 'happy hour' in the Vineyard Gardens. 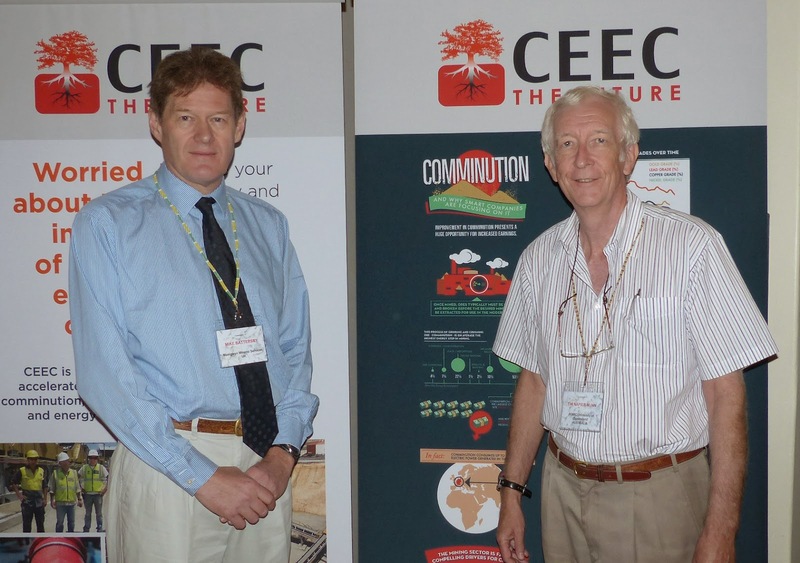 It is a privilege to have two directors of the Coalition for Eco-Efficient Comminution (CEEC) at the event, Prof. Tim Napier-Munn of Australia's JKMRC, and Mike Battersby, of Maelgwyn Mineral Services, UK. 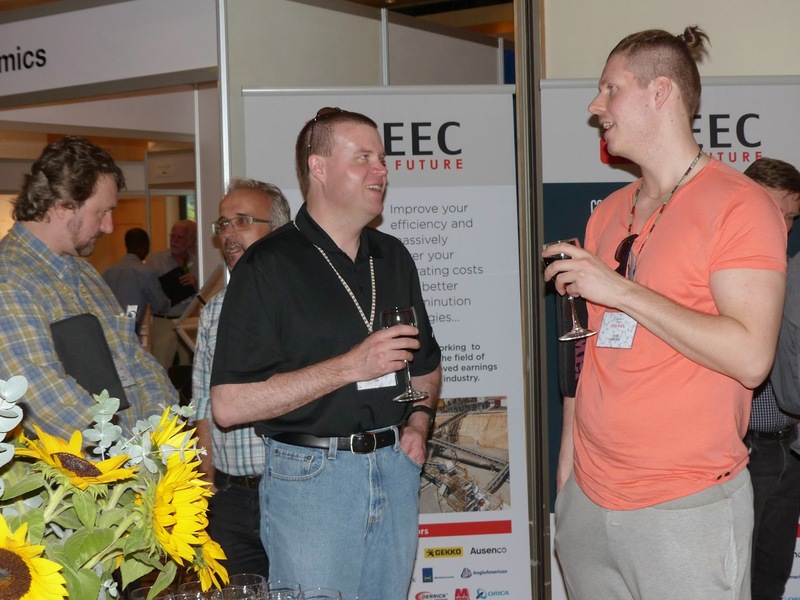 CEEC is a not-for-profit global organisation fully funded by the mining industry to advance the adoption of more efficient processes in the energy-demanding area of comminution. 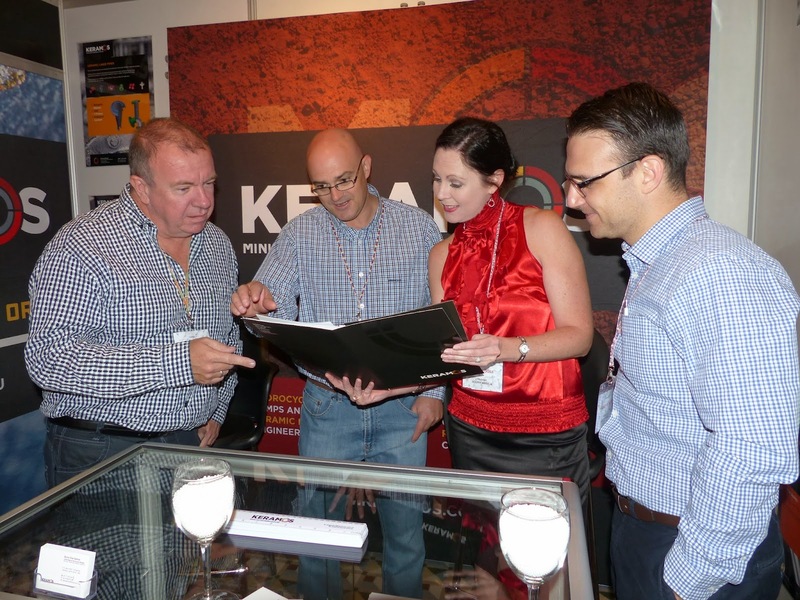 Is this really an important issue for the mining industry? If so, can comminution energy be substantially reduced in a reasonable time frame? What are the drivers that will motivate change, and what should now be done? The conclusions of the paper are pessimistic in the sense that forces may be gathering that will demand that the issue be addressed across the industry in the relatively near future, but optimistic in the sense that there is a clear development path. There is much that can be done with what is already known, and considerable promise exists in new developments which can be realised through sustained and focused R&D, building on new knowledge acquired in the last 20 years. He referred to the CEEC Roadmap, which gives no less than 52 suggestions, both short-term and long-term, for action which can be taken to reduce the energy used in comminution, and which are outlined in his paper. The keynote set the scene for an interesting morning session with eight papers from Austria, Australia, Canada, Germany and South Africa. 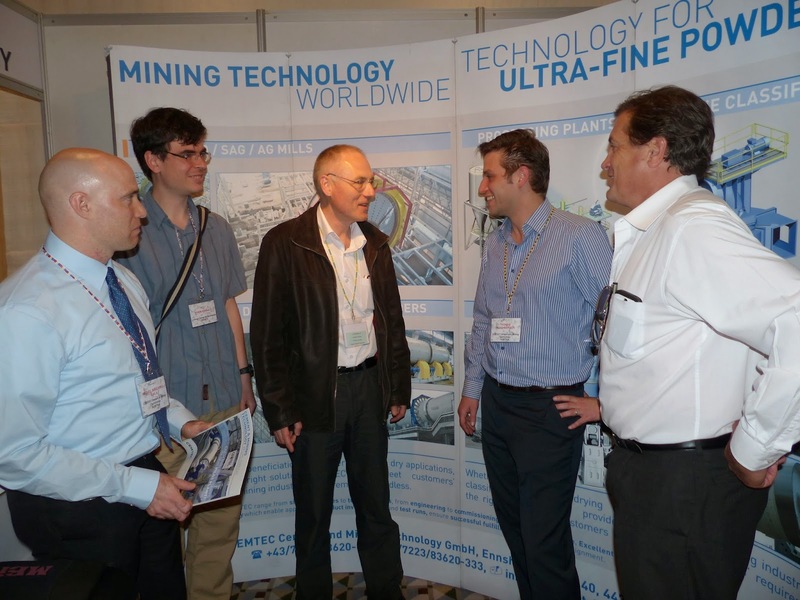 Austrian company Cemtec Cement and Mining Technology's Thomas Plochberger highlighted once more the value of collaboration. 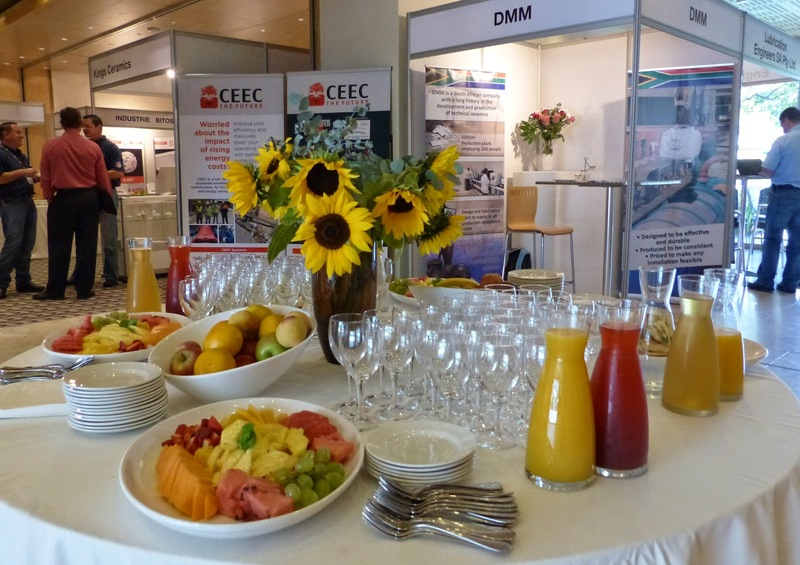 Cemtec, who is exhibiting at the conference, is working in collaboration with the Montan Universitaet Leoben in order to compare vertical roller mills and tumbling mills on the basis of energy consumption. Modelling of energy distribution in tumbling mills has been investigated at the University of Cape Town using positron emission particle tracking, a technique now really proving its worth in understanding comminution and flotation processes, as is coupled DEM (Discrete Element Method) and SPH (smoothed particle hydrodynamics) the latter two being described in a paper by Paul Cleary of CSIRO. 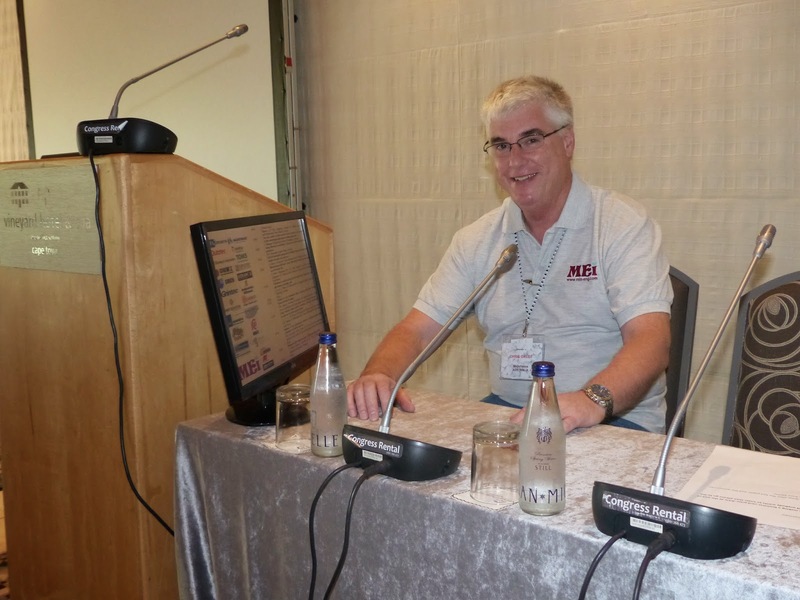 John Starkey, of conference sponsor Starkey & Associates, presented an interesting paper questioning the accuracy of comminution tests, based on the performance of recent new plants, which led to an interesting discussion. 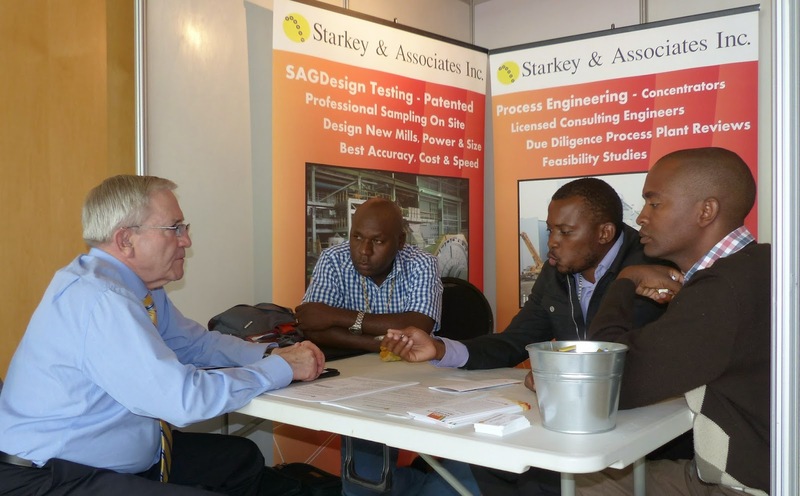 He offered guidance on what test data is reasonably the minimum required for a Bankable Feasibility Study, with respect to the scope and size of the project, the accuracy of the results presented, and the cost of doing the required test work and mill sizing calculations. Six papers on high pressure grinding rolls were presented in the afternoon session, including an interesting presentation from FLSmidth on an HPGR pilot test campaign at their Rio Tinto Kennecott Utah Copper LLC. Mine. 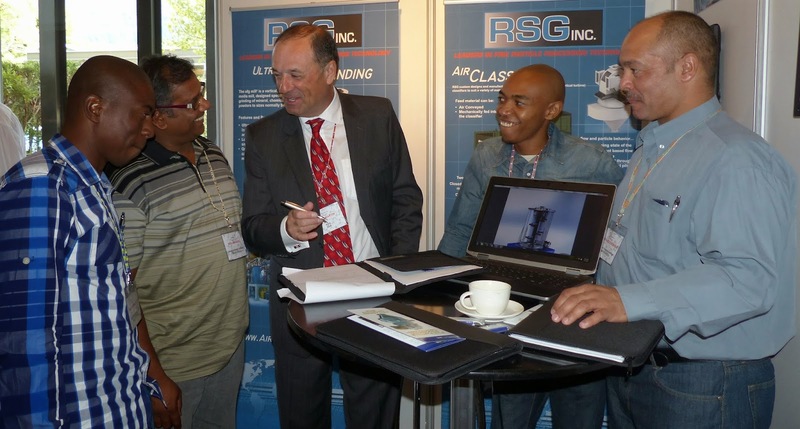 With increasing global interest in HPGR technology, FLSmidth engineers have been developing and testing HPGR solutions and introducing this specialized equipment into its minerals applications. HPGRs are not new to FLSmidth as the technology is actually taken from the legacy FLSmidth® Hydraulic Roll Press (HRP) operating successfully in the cement industry. 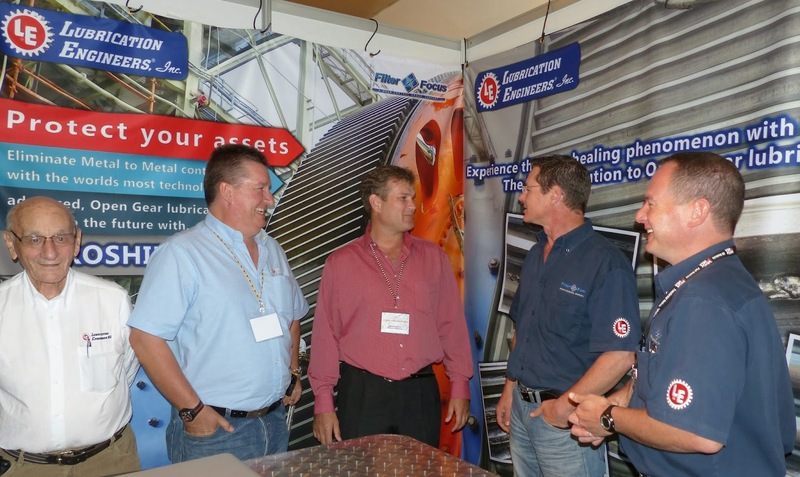 FLSmidth has been involved with HRP’s since the early 1980s with over 50 units sold to the industry. The FLSmidth HPGR is already mechanically proven, as evident by the fact that cement applications run at a higher grinding pressure than most mineral hard rock applications. 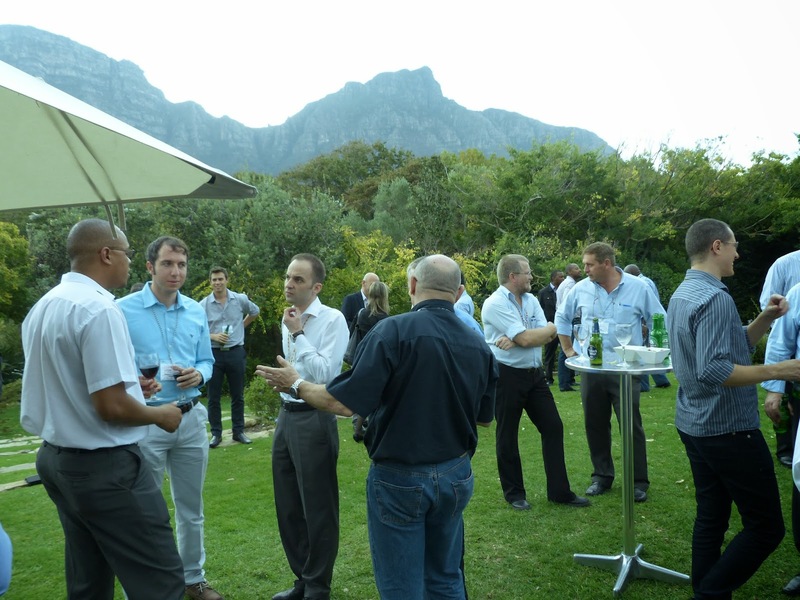 It was good to get away from the conference atmosphere in the evening, for the conference dinner at the Gold Restaurant at Green Point, on the other side of the city. 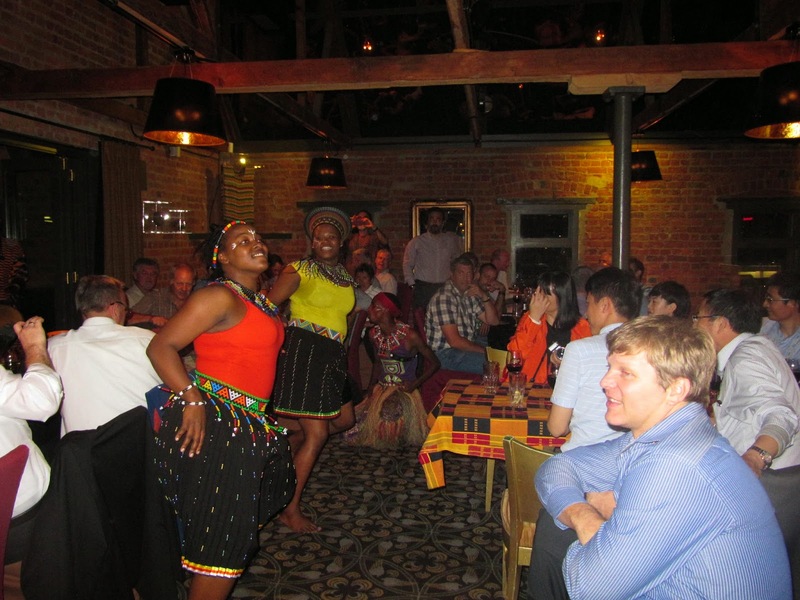 An evening of great entertainment, food and wine (see posting of 9th April and YouTube video). 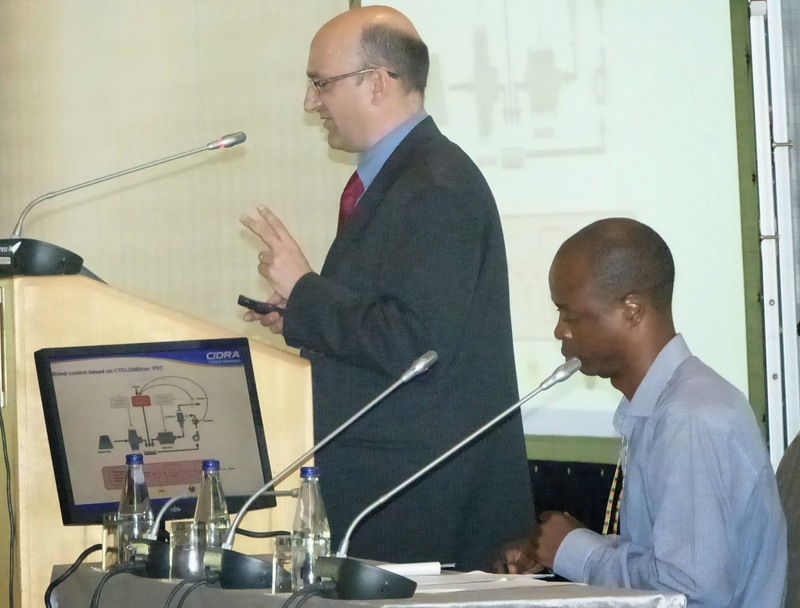 This morning's keynote was presented by Dr. Wolfgang Peukert, Director of the Institute of Particle Technology at the University of Erlangen, Germany. He presented a multiscale picture of grinding, ranging from process modeling down to defect formation and fracture at the lower nanoscale. Comminution in stirred media mills in the liquid phase enables the production of ultrafine particles down to the lower nanometer range. During mechanical stressing of the particles, defects are generated in the crystalline lattice, which enhance the elastically stored energy and weaken the material, so that breakage occurs even down to a range of 10 nm. High resolution TEM analysis and molecular dynamics simulations allow detailed insight into the rich structures evolving inside the nanoparticles. Below a critical size, defects cannot be stored in the crystallites and the overall limit of grinding is reached. The grinding limit is strongly influenced by material properties and hardly affected by the process conditions in the analyzed range of experimental parameters. Whereas the grinding limit depends on materials properties, the breakage kinetic is strongly influenced by the process parameters and suspension conditions as long as the grinding limit is not reached. 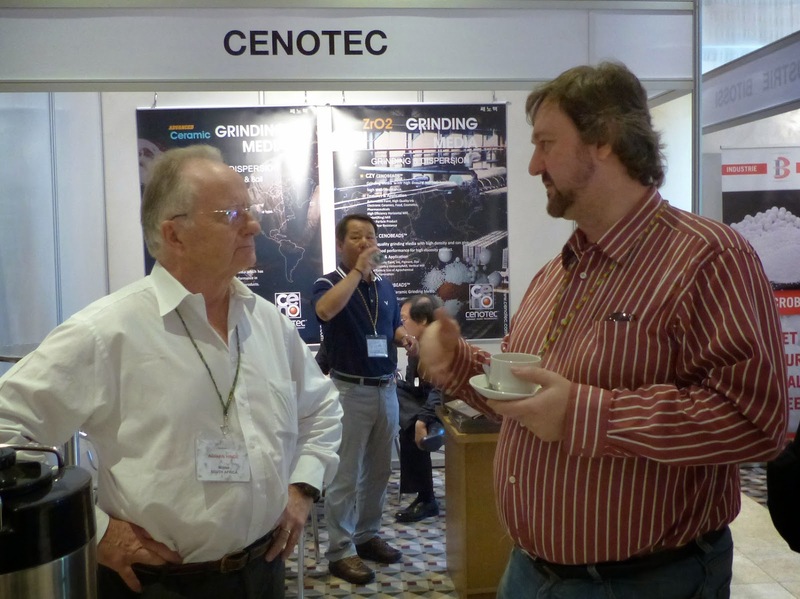 The keynote was followed by eight papers on ultrafine grinding, from Australia, Canada, Finland, Germany and USA. 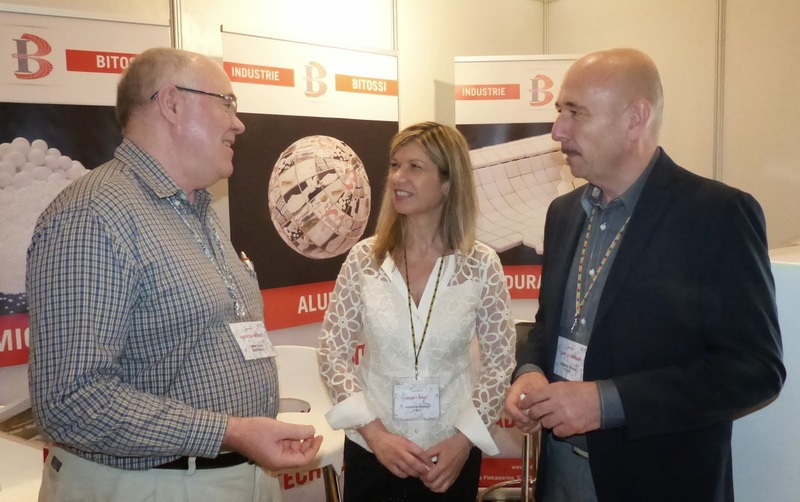 Harri Lehto, of conference sponsor Outotec, showed how the demand for finer grinds has set new challenges for comminution technology. In addition to just performing the grinding duty itself, the other challenge is to perform the grinding with lower energy utilisation. 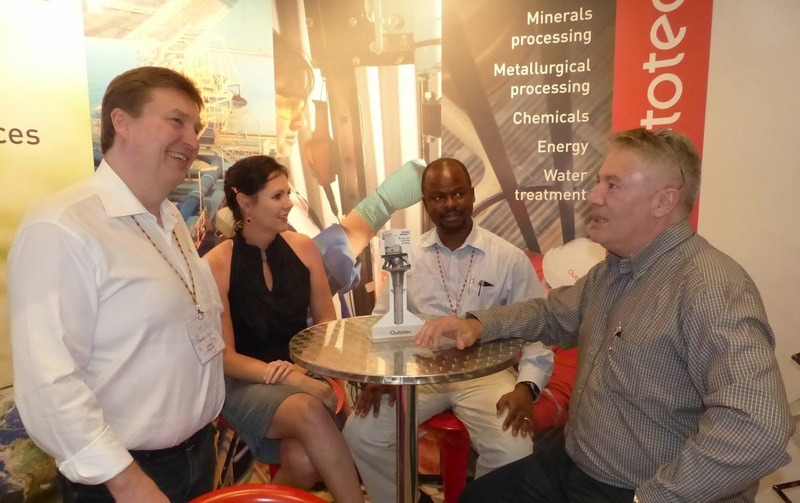 New technology introduced by Outotec is based on existing, well proven stirred milling technology, previously being available only for white minerals processing. 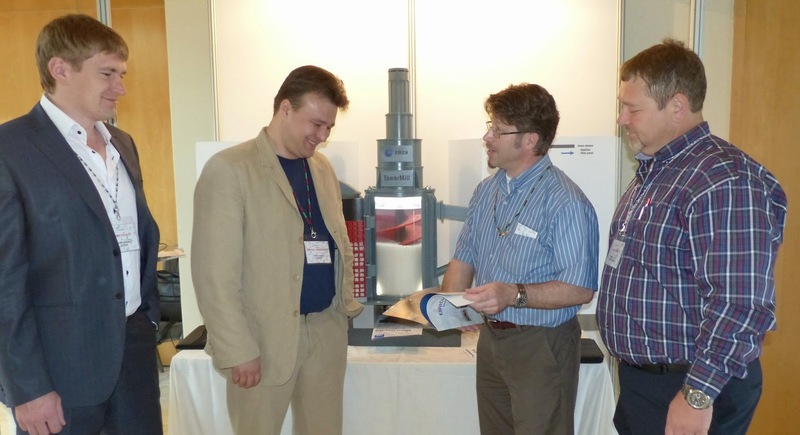 German company Eirich are sponsoring for the first time, and were demonstrating their TowerMill, a proven vertical agitated media mill, originally invented in Japan in the 1950s. The original idea was to rotate the horizontal chamber of the tumbling mill into a vertical position, while adding an agitator screw to improve energy transfer to the grinding media, while keeping the grinding chamber stationary. This design proved successful in achieving fine product sizes with reduced energy consumption, and the TowerMill quickly found applications in both wet and dry grinding plants. 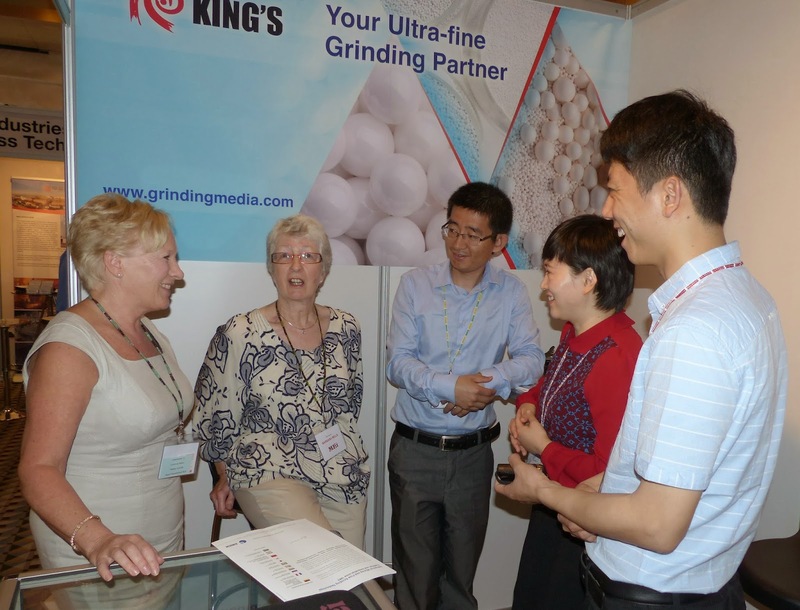 The fact that seven of the conference sponsors provide ceramic grinding media emphasises the increasing importance of stirred milling, and two of the sponsors presented papers in the afternoon session. 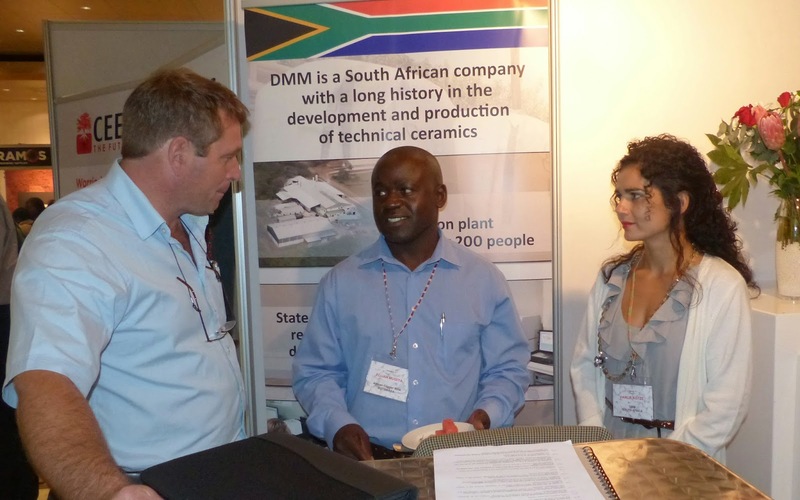 Alex Wang of Chinese company King's Ceramics, described a wear-rate testing method and Hanlie Kotzé of DMM, South Africa, evaluated the importance of wear in the selection of ceramic grinding media. Alan Muir's keynote lecture on Monday suggested that impact, compression or abrasion might in the future be superseded by some new science, but what would it be based on? 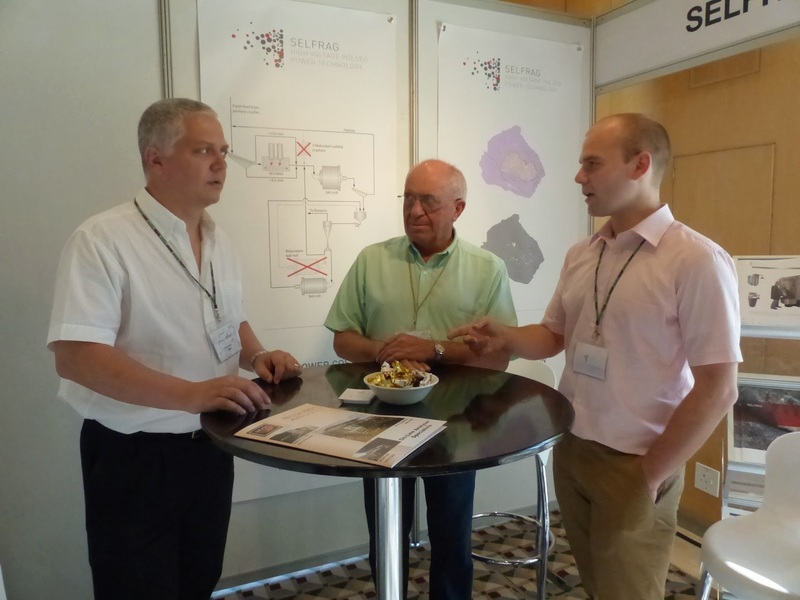 SELFRAG has already demonstrated that one avenue to follow may lie in electro- fragmentation of particles, a technology which haas consistently been demonstrated on a batch process basis but which has yet to be proven on a commercial basis for large scale continuous processing. 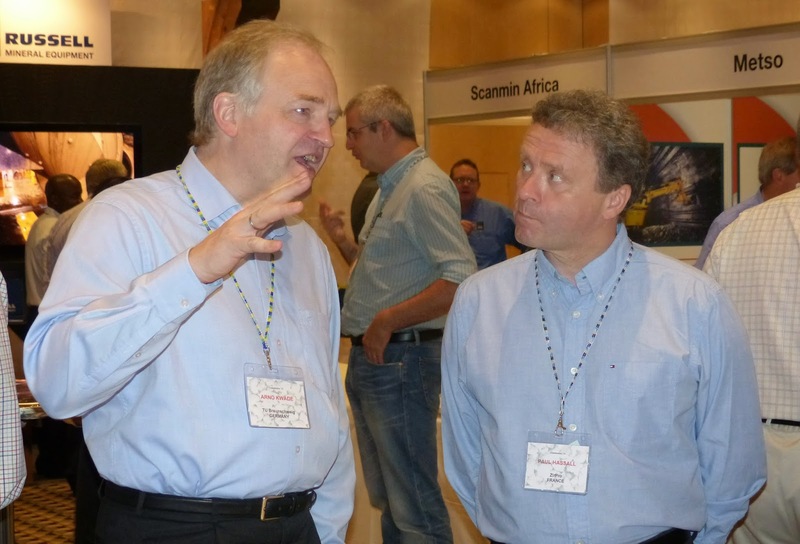 However, Alan's company, AngloGold Ashanti is watching the technology with interest, and SELFRAG 's Klaas van der Wielen says large scale commercialisation is planned for 2016 or 2017 (see MEI Online for full story). This is undoubtedly exciting innovative technology, and in this afternoon's session Dr. van der Wielen presented a number of relationships to describe high voltage breakage behaviour of an ore. Based on these relationships, a standardised methodology was outlined for single particle testing that allows for assessment of weakening and size reduction and the optimum generator setup. Innovative technology such as this evolves from 'thinking outside of the sphere' the theme of a quirky paper from Peter Radziszewski of Metso, Canada (left in photo), who entertained the audience with "adventures in space mining", describing common traits between space and terrestrial mining, an overview of a few research activities inspired by a space mining context and the possible benefits of pursuing research in this area, where comminution technology would need to adapt to lower gravity regimes. 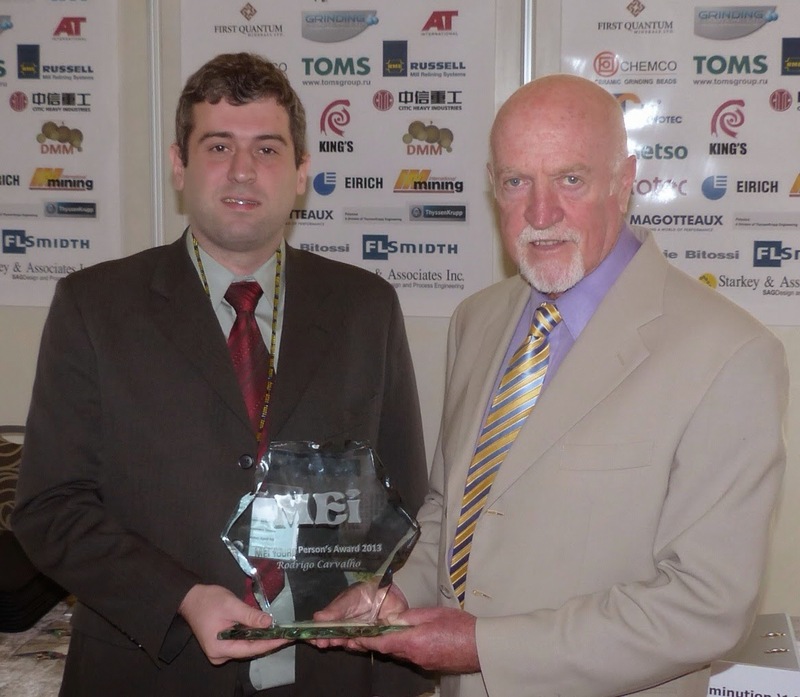 Russell Mining Equipment (RME) was established in 1985-86 by John Russell, with a vision to mechanise the entire mill relining process, shorten reline times, shorten overall shut-down times, increase plant utilisation, increase mine site profitability, all achieved while concurrently improving the safety of the working environment. 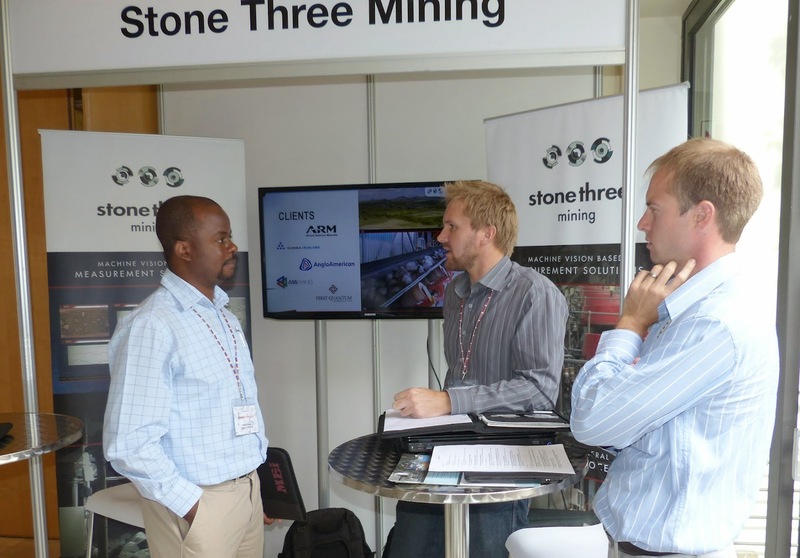 It is good to have RME exhibiting and sponsoring for the first time. An eclectic mix of papers today, including innovations in cone crusher technology, optimisation of grinding mills and circuits, and an interesting paper by Chris Greet of conference sponsor Magotteaux, who provided examples of how focusing on grinding chemistry as part of an optimisation study of the comminution circuit can lead to significant metallurgical benefits in downstream processing. 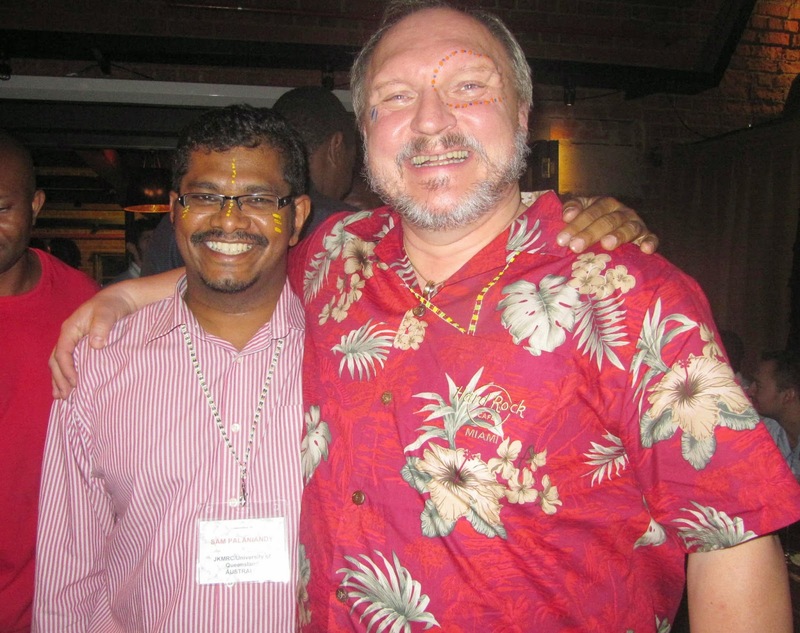 This highlighted an observation made by Prof. Graeme Jameson in his Distinguished Lecture on Flotation at Metplant '13 (posting of 20 July 2013), where he concluded that flotation researchers and comminution specialists should talk more to each other. 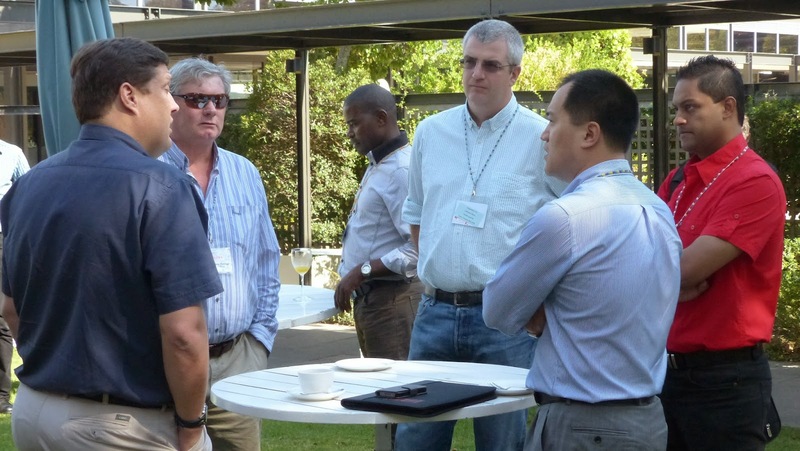 He gave the example of MEI's Flotation and Comminution conferences, which tend to have delegates dedicated only to each of these events, so hopefully Chris, a regular flotation conference participant, attending a comminution conference for the first time, might set a trend for more interaction between researchers in these specialised areas. The conference began with an excellent presentation 3 days ago, and finished with an excellent one by Christian O'Keefe of CidRA Minerals, USA, on grind circuit optimization at Rio Tinto Kennecott using real-time measurement of individual hydrocyclone overflow stream particle size enabled by novel CYCLONEtracSM technology. 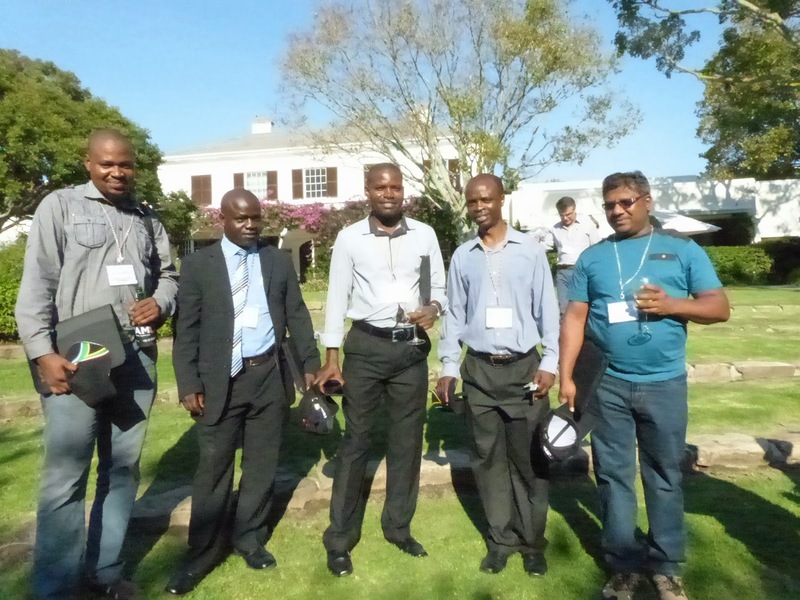 After a fine summary of the conference by MEI Consultant Aubrey Mainza, of the University of Cape Town, he led an excellent panel discussion on the future of comminution. 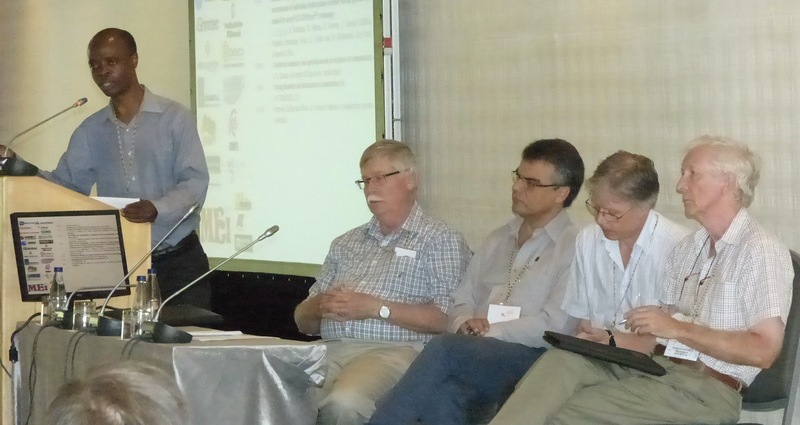 The panelists were Rob Morrison of the JKMRC, Wolfgang Peukert of University of Erlangen-Nuremberg, Marcelo Tavares of University of Rio de Janeiro and Tim Napier-Munn of JKMRC, and their views led to some interesting discussion from the audience. A full report on Aubrey's summing up, and the panel discussion will be published later on the blog. 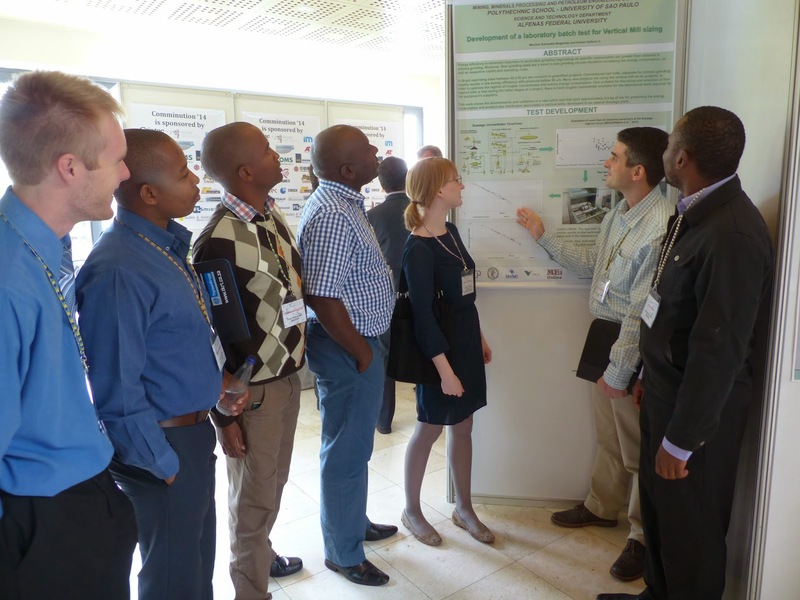 It has been an excellent 4 days, with some really innovative work being presented. 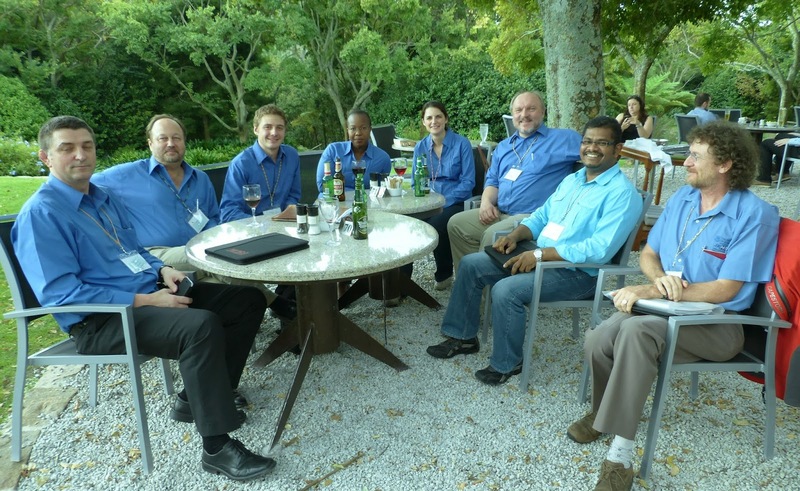 All authors have been invited to submit final papers to Minerals Engineering for peer-review for a special issue scheduled for 2015. The Proceedings flash drive, containing draft papers is available from MEI Online. 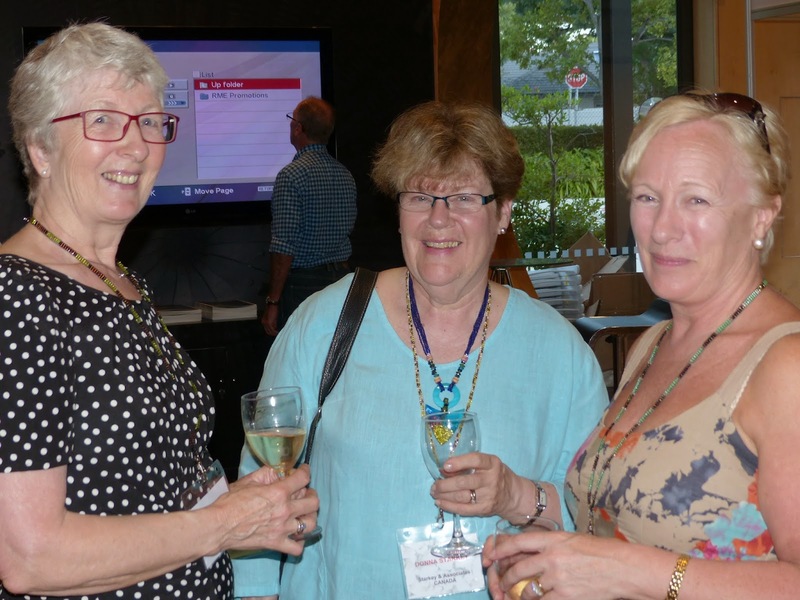 Amanda closed the conference and invited everyone to Comminution '16, which will be held at the Vineyard again in April 2016, before we all adjourned to the hotel gardens again for final farewells over glasses of wine.